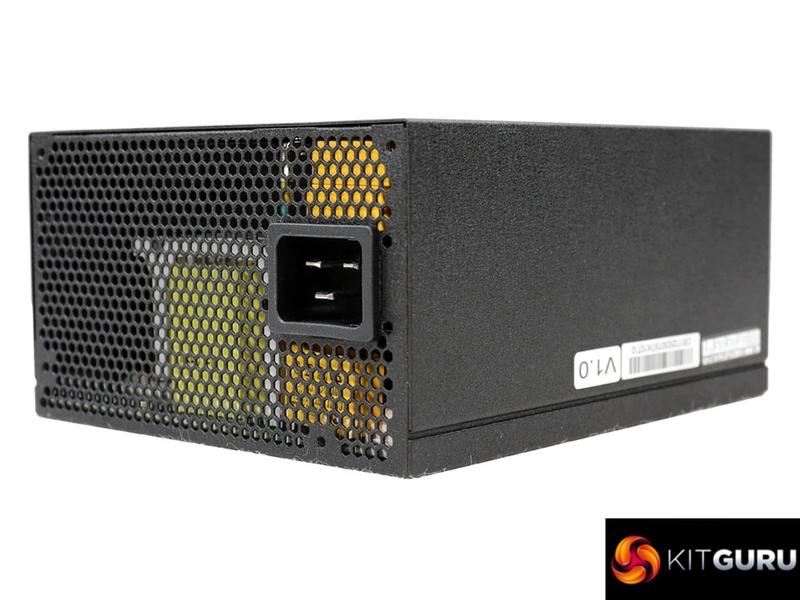 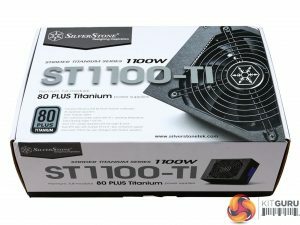 All 80 PLUS Titanium and ETA-A+ certified power supplies have stiff prices, since they use the most efficient platforms that today’s technology can provide. The Titanium level sits on top of the 80 PLUS standard’s range, while Cybenetics has an even higher certification, the ETA-A++, which for the moment is out of reach for every desktop PSU. Only once the minor rails are abandoned and the +12V rail remains alone, then there will be a strong possibility for over 94% overall efficiency, as the ETA-A++ certification requires. 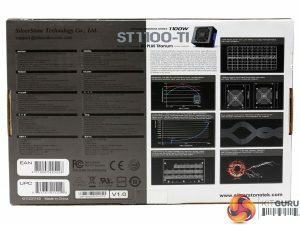 The ST-1100 TI belongs to the Strider Titanium line which currently is SilverStone’s flag holder. 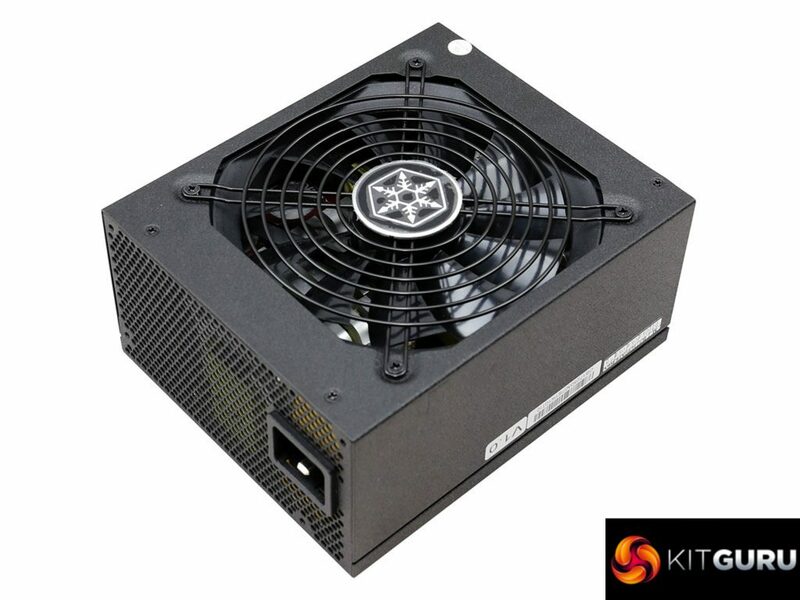 There are three members in this line with their capacities ranging from 1100W to 1500W, and all share the same compact dimensions with 180mm length, which is quite small for such powerful units. 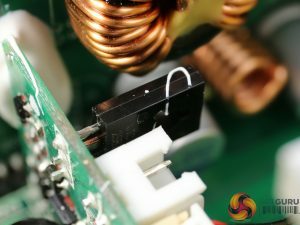 Features like a fully modular cable design and a semi-passive operation are a must in this high-end category and the only thing that is missing is a power switch, which is still an essential part to any power supply, according to our expert opinion. 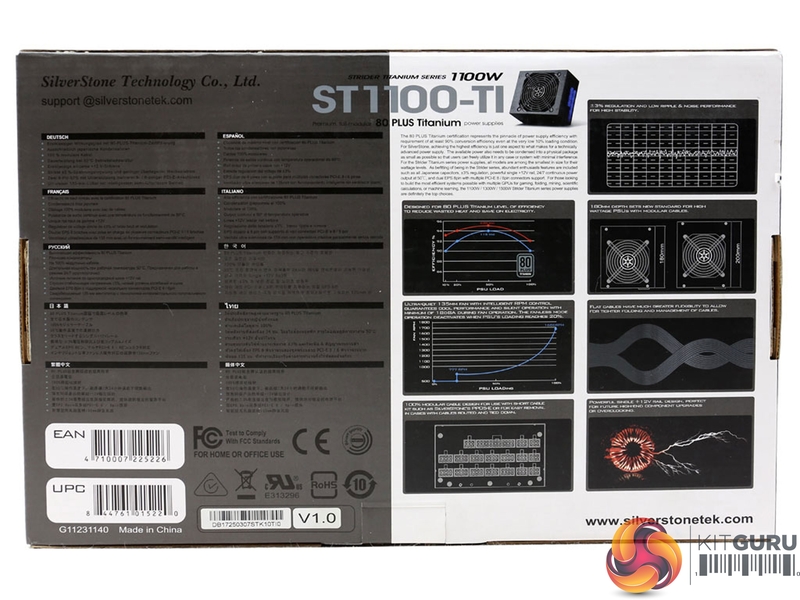 The ST1100-TI promises for 24/7 continuous power output with 50°C operating temperature, something that not many units can do, under real life conditions at least. 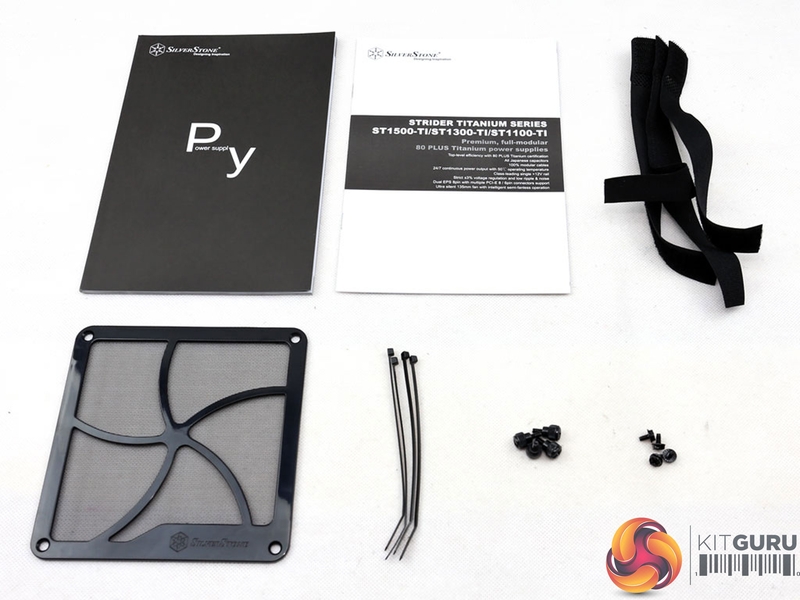 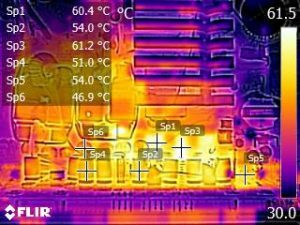 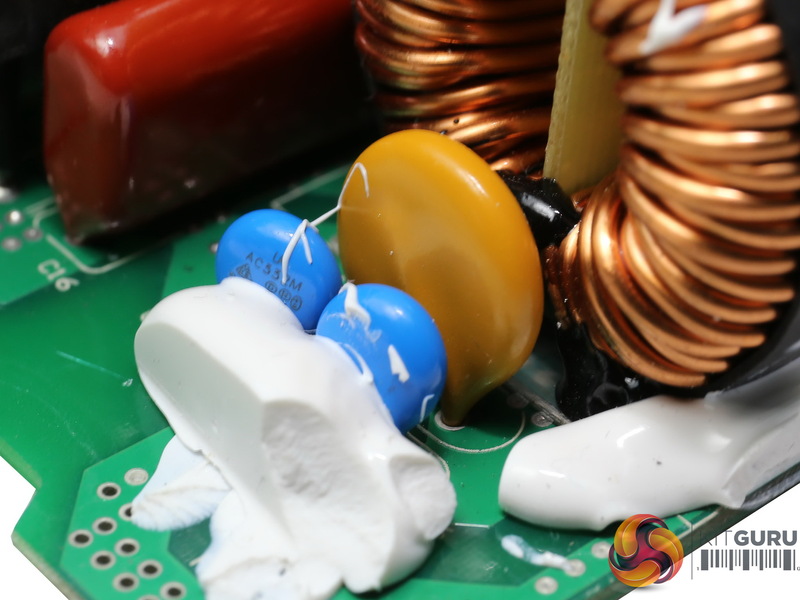 A 50°C ambient applies huge stress especially to sensitive parts like electrolytic capacitors and on top of that, you need a highly efficient platform in order to be able to keep the temperature at the PSU’s internals under control. The minor rails have enough power to meet today’s needs, while the +12V rail can deliver up to 92 Amps of current. 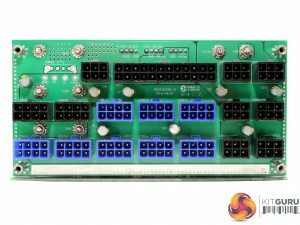 Finally, the 5VSB rail has 15W capacity. We would like to see 20W at least in a 1100W PSU but those are just the paper specs. 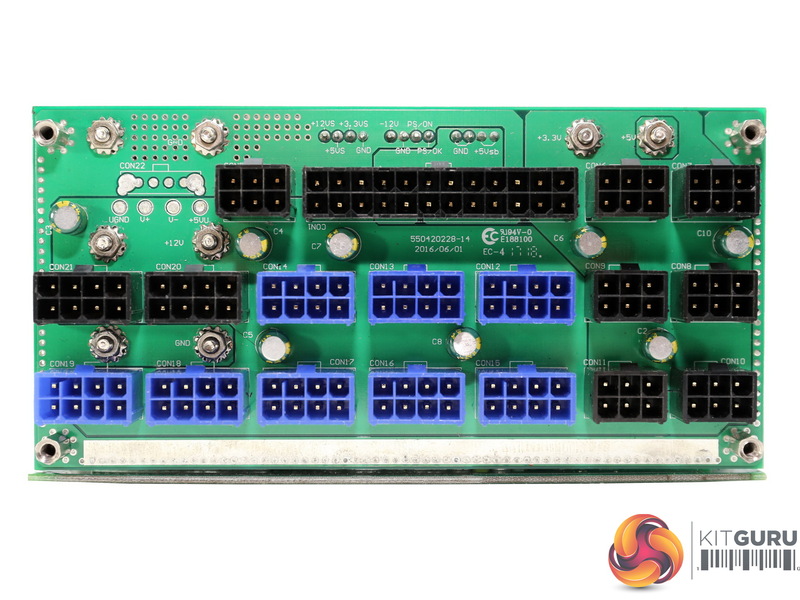 Under real life conditions this unit’s 5VSB rail can deliver much more than 3 Amps. 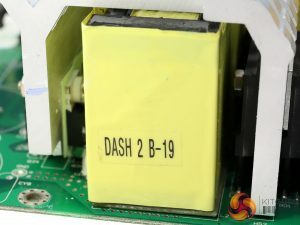 As expected, there are two EPS connectors with one of them being much shorter than the other. Normally both EPS connectors should have about the same length, especially since this unit is likely to be paired with a big chassis. 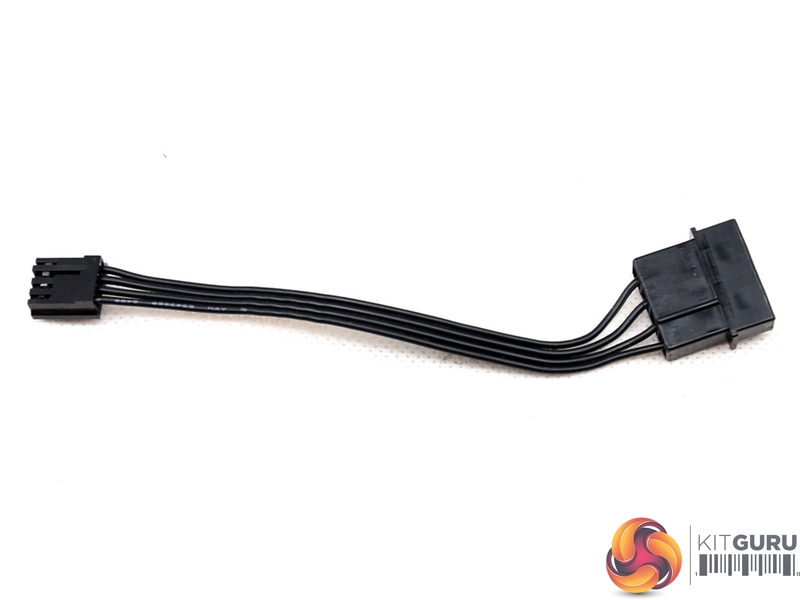 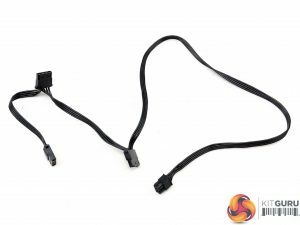 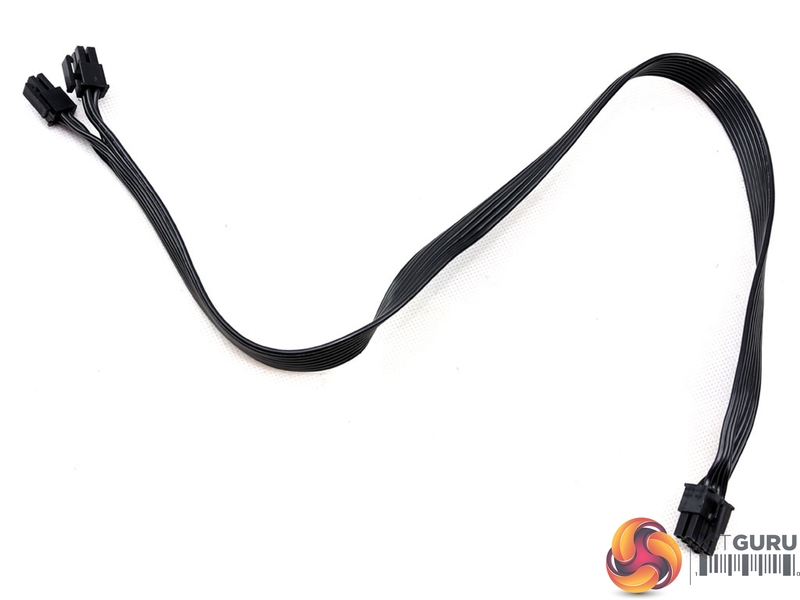 The number of PCIe connectors is adequate and it is a great advantage that all of them are installed on dedicated cables. 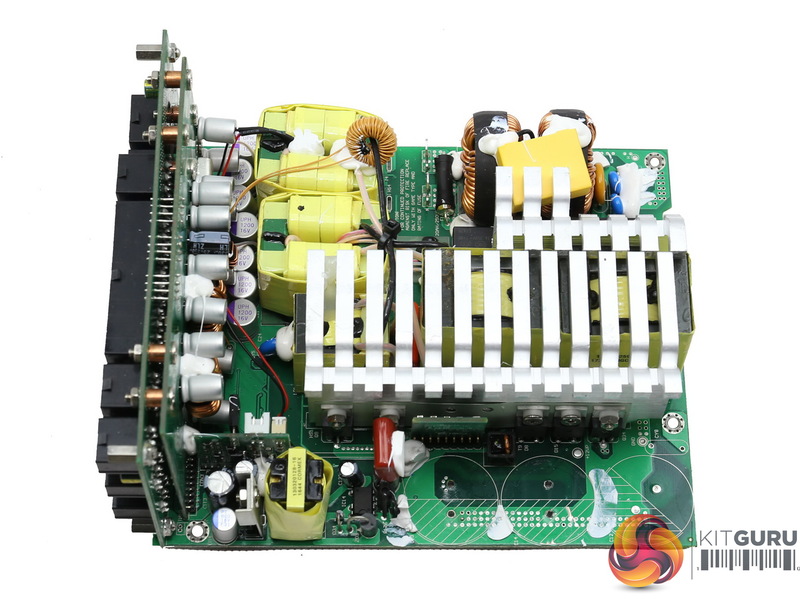 This way, energy losses are kept low since there are no excess voltage drops. 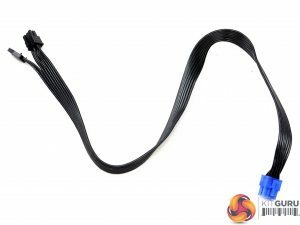 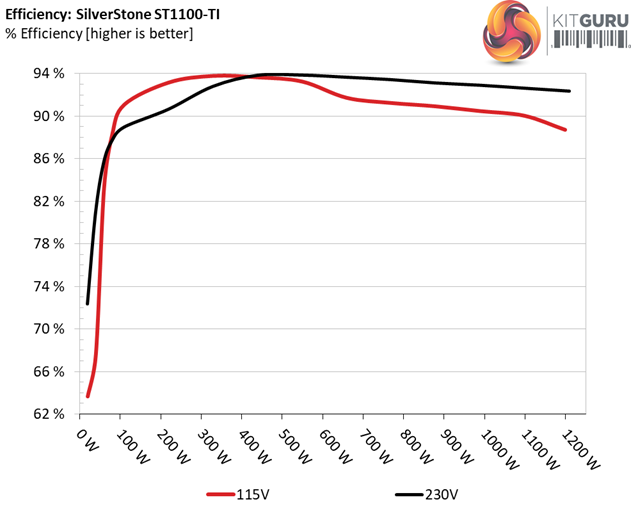 To further restrict voltage drops, SilverStone also used thicker 16AWG gauges on the cables that will have to handle high loads. With 16x SATA connectors you can easily power a storage server while the number of 4-pin Molex is satisfactory, as well. For those of you that still need a berg connector, which is rarely used nowadays, there is also a 4-pin Molex to FDD adapter included in the product’s bundle. Finally, the distance between the peripheral cables is ideal at 140-150mm. 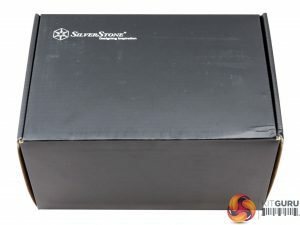 The box is large and heavy, with an interesting graphics design. 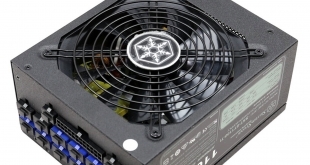 At the front there is a cropped photo of the PSU with the fan grille shown. 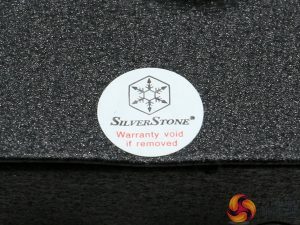 The model number is highlighted in large grey fonts and the large 80 PLUS Titanium badge is located in the bottom-left corner. 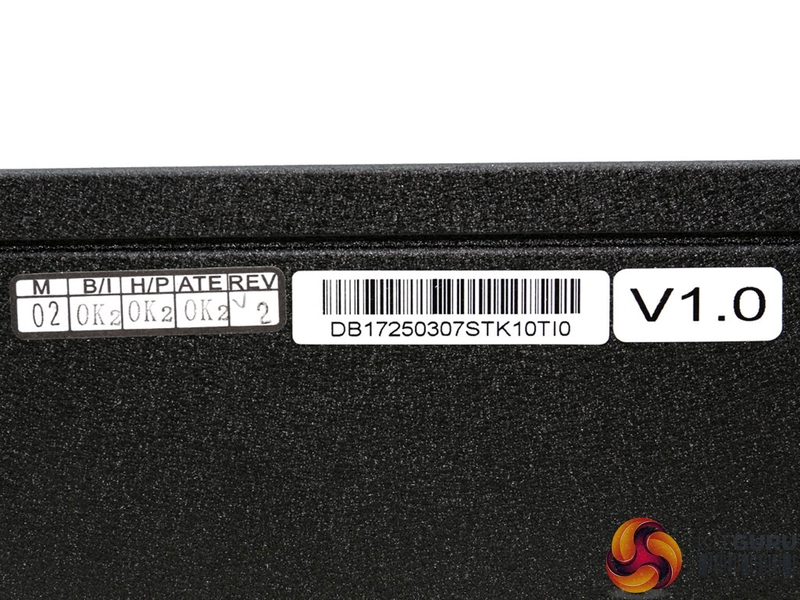 A multilingual, brief features description can be found at the back of the box along with several graphs and schemes. 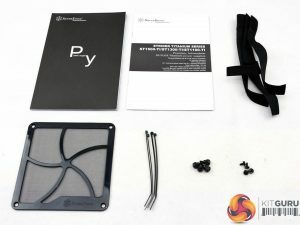 The bundle is rich since it includes Velcro straps, zip ties, two sets of fixing bolts, a magnetic fan filter and two manuals. SilverStone also ships lots of paperwork with all of its power supplies. 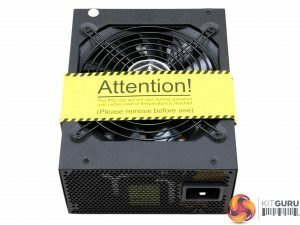 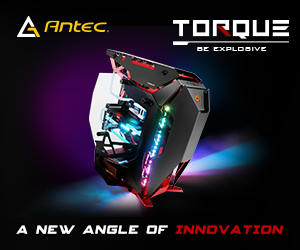 A large ‘attention’ note informs the owners of this product that the PSU is equipped with a semi-passive mode, so its fan won’t spin under light loads. 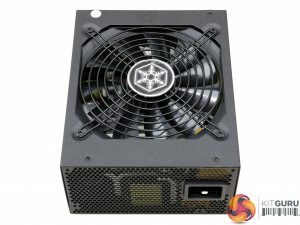 The lack of a power switch surely helps the airflow, however such switches come handy in PSUs so we think they shouldn’t be omitted from the design. 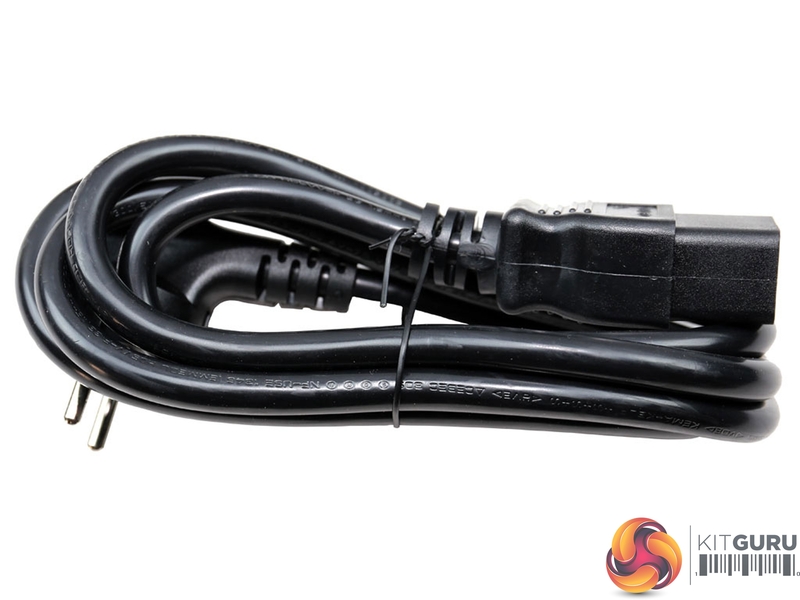 The heavy-duty C20 AC inlet can handle up to 16 Amperes. 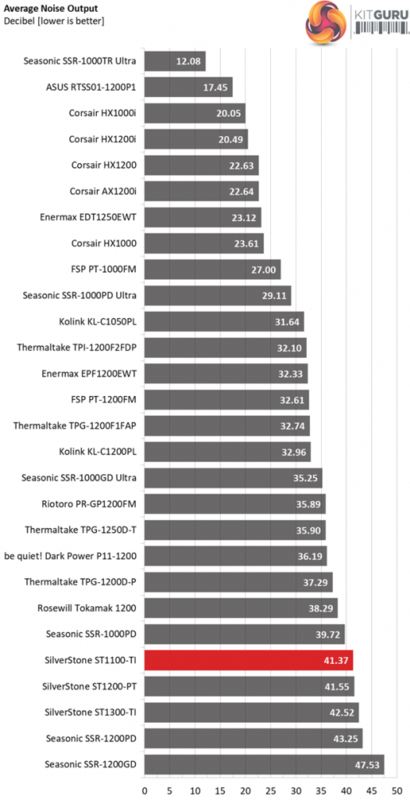 It is probably an overkill for a 1.1kW PSU, but it surely is an advantage. 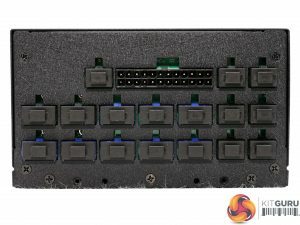 If only there was a power switch along with a button to toggle on/off the semi-passive mode. 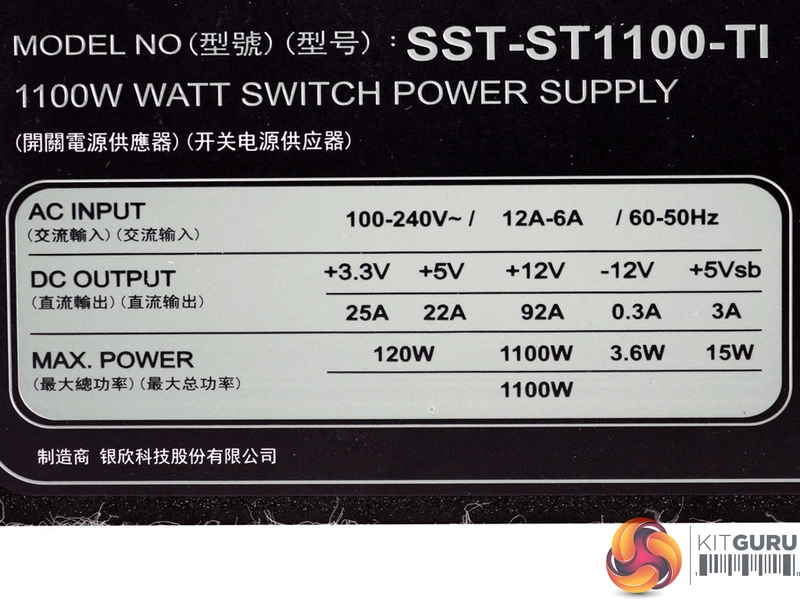 On the sides you will find the power specifications label and several stickers, with one of them depicting the unit’s version. 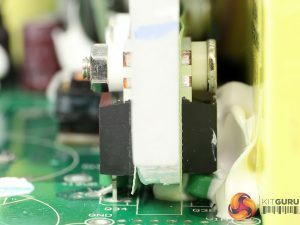 On the bottom there is another sticker, providing a description of the modular sockets. 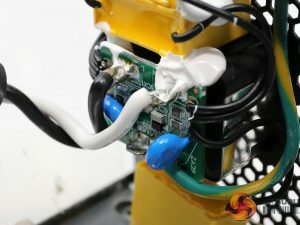 There are a lot of modular sockets, with most of them covered by silicone caps which is a nice touch. 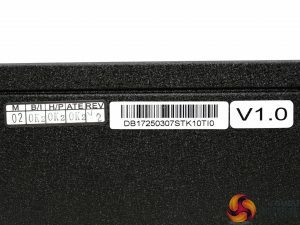 There is also a ‘warranty void if removed’ sticker, which won’t stay there for long since we have to take apart this unit and take a detailed look at its internals. 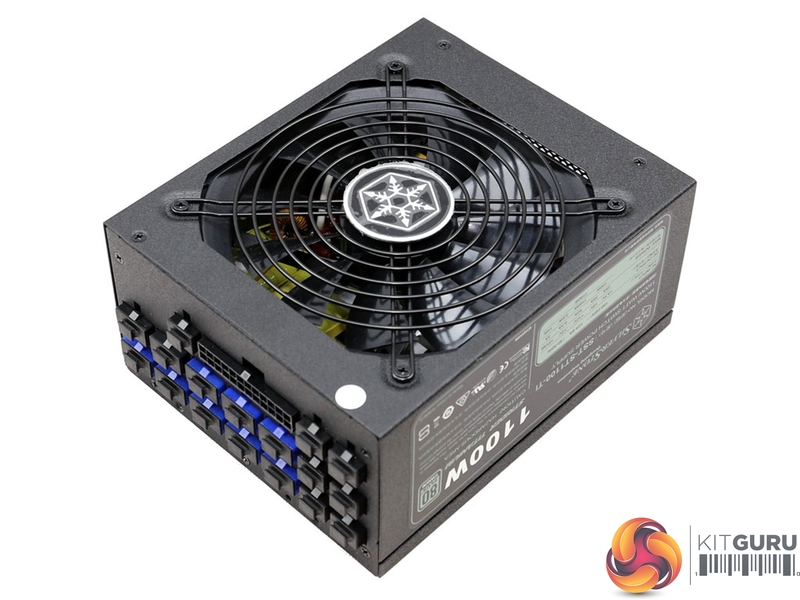 Given that the 1500W model shares the same dimensions as this unit, the 180mm depth isn’t as impressive for the 1100W output power of this model. 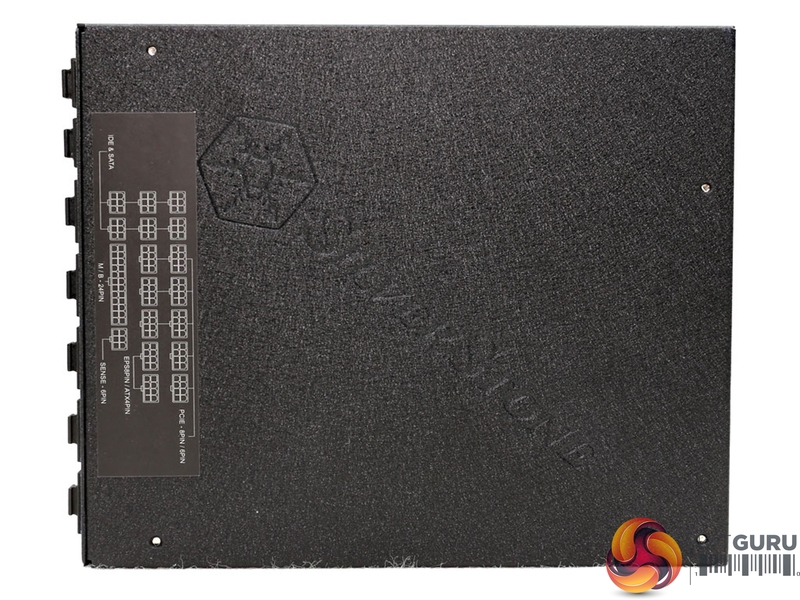 On the bright side, the finish quality is high and the semi-matte coating doesn’t attract fingerprints. 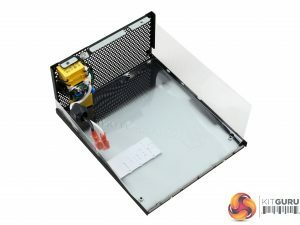 This platform is provided by Enhance Electronics and the build quality looks high, components from well-known brands have been used and the design is modern. 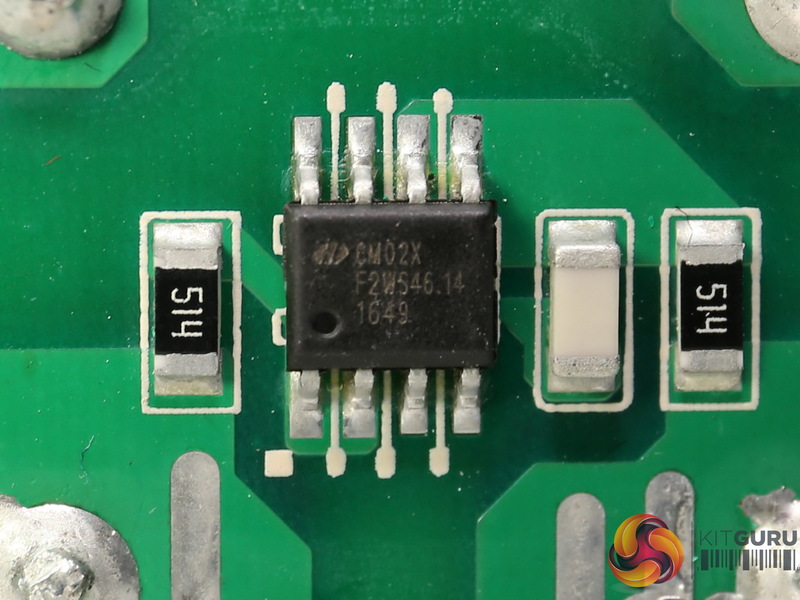 In the primary side we meet a full-bridge topology and an LLC resonant converter. 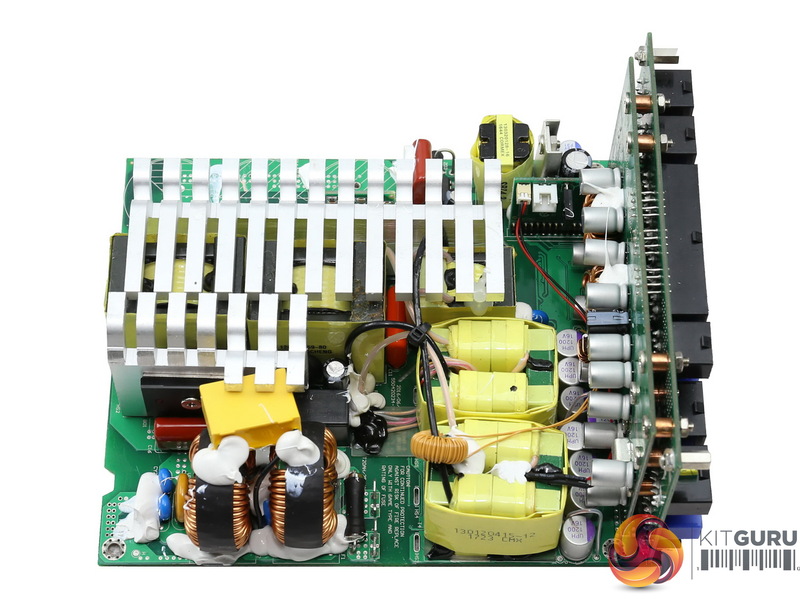 This is the typical combination for both high output power and increased efficiency. 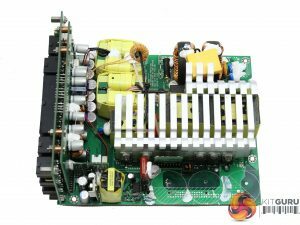 The secondary side uses a synchronous design where a number of FETs regulate the +12V rail and two DC-DC converters generate the minor rails. 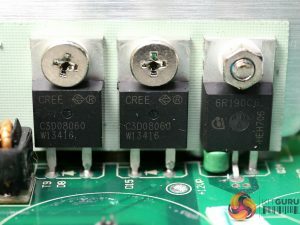 The EMI filter is complete with six Y caps, four X ones, two CM chokes, a CM02x discharge IC and a MOV. We couldn’t ask for more components in this stage, however the performance still isn’t optimal since we measured an EMI spike at a higher frequency. 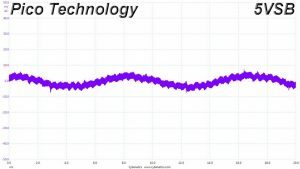 Usually there is increased EMI at lower frequencies, but this is not the case here. 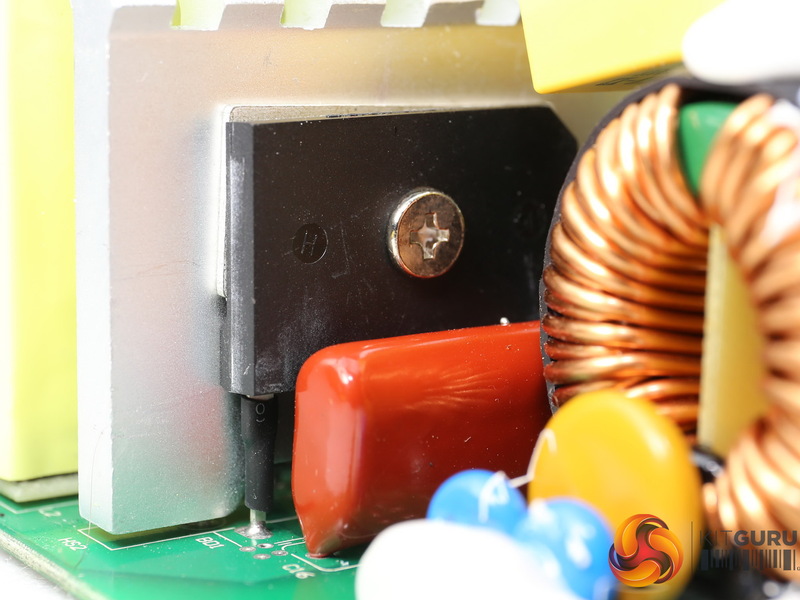 There is a NTC thermistor for protection against large inrush currents. 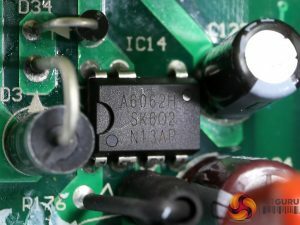 It is supported by a bypass relay. The pair of powerful bridge rectifiers can handle up to 50 Amperes of current. Two Infineon IPP60R190C6 FETs chop the fully rectified signal coming out of the bridge rectifiers and two CREE C3D08060A boost diodes provide protection against large freewheeling currents. 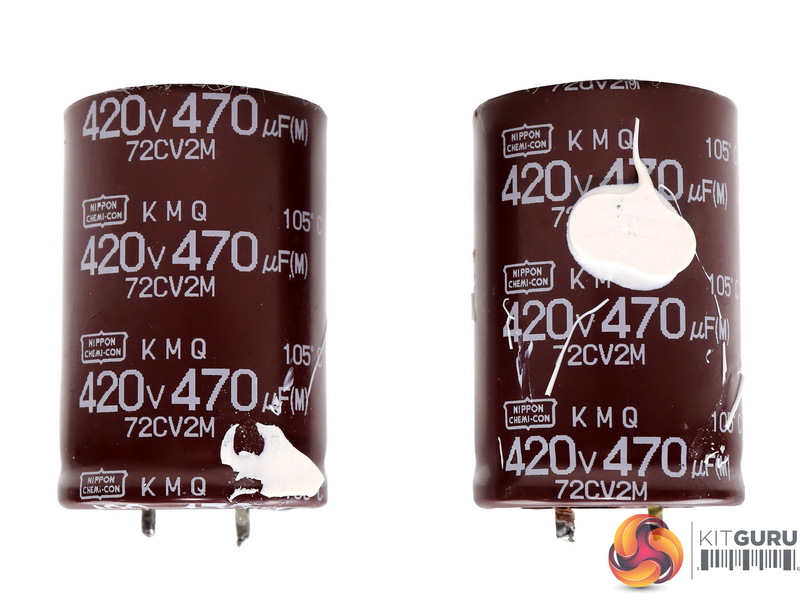 The bulk caps are two Nippon Chemi-Con KMQs with 470uF each or 940uF, which clearly is not enough to provide a long enough hold-up time. 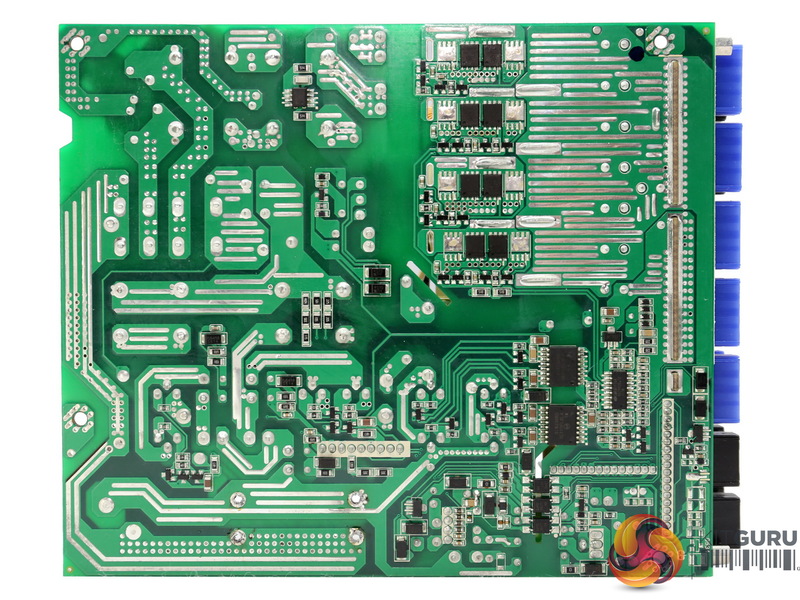 The APFC controller, a Champion CM6502S, along with a CM03X Green PFC controller are installed onto this small daughter-board. 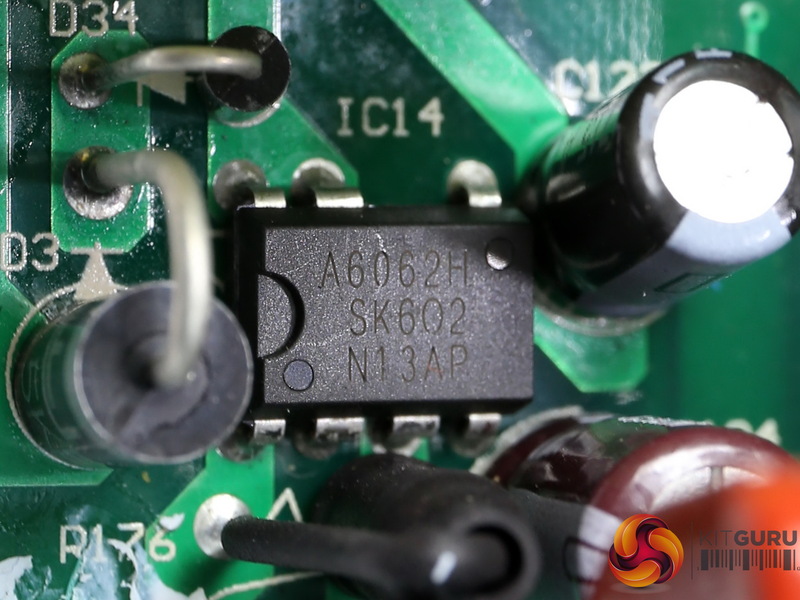 The main switching FETs are four Infineon IPP60R190C6, which are configured into a full-bridge topology. 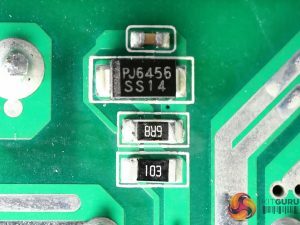 Their driver ICs are two Silicon Labs Si8230BD, soldered on the back of the main PCB. Finally, an LLC resonant converter is also used, to restrict the switching losses. 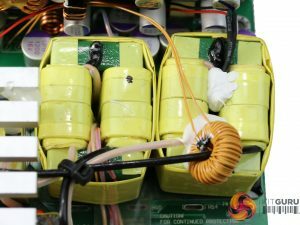 Two parallel transformers isolate the primary and secondary sides. In the secondary side, eight Infineon BSC014N04LS FETs regulate the +12V rail. 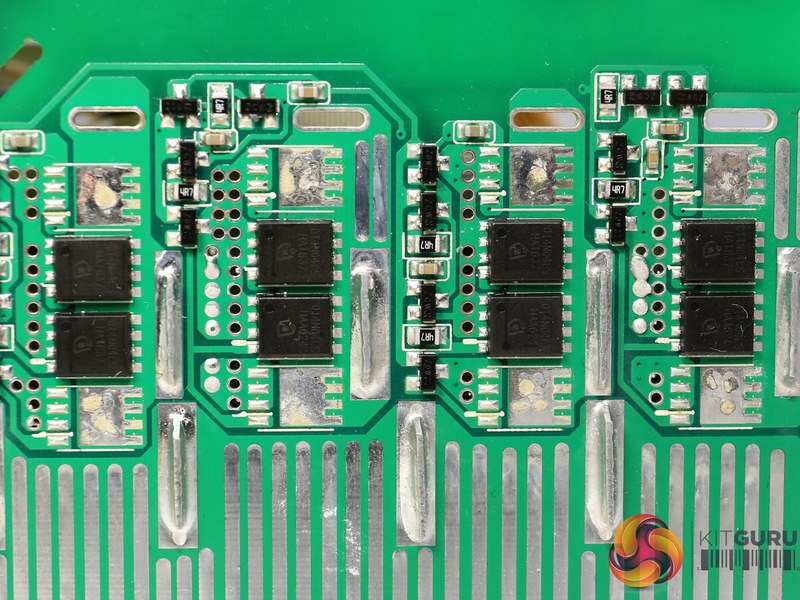 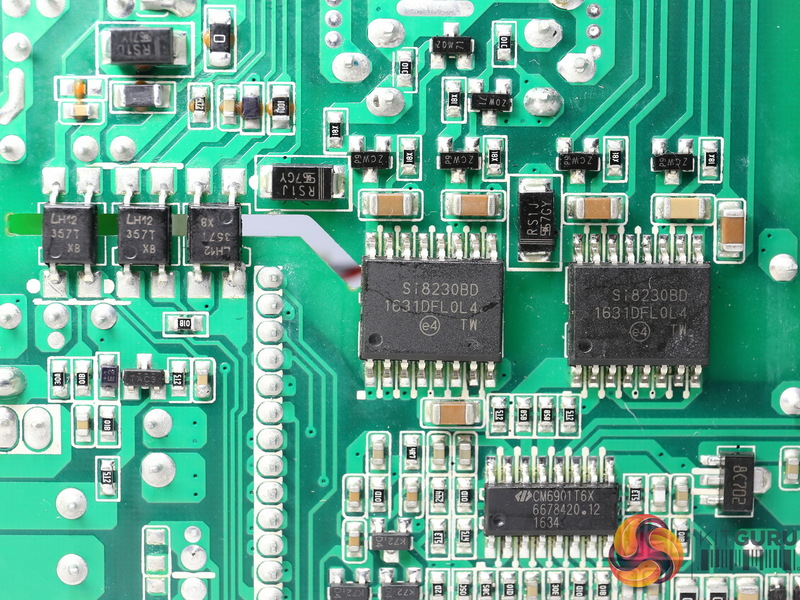 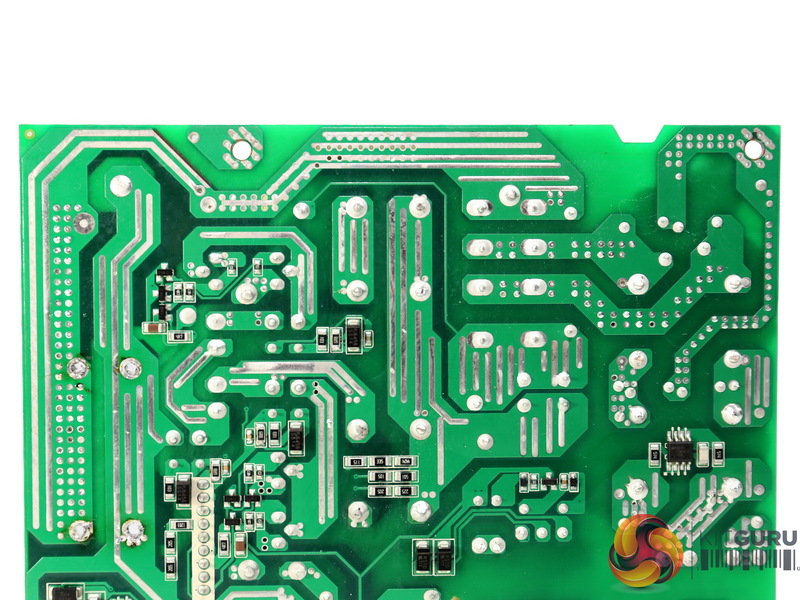 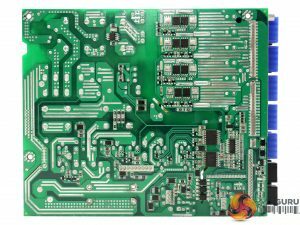 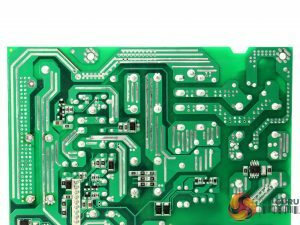 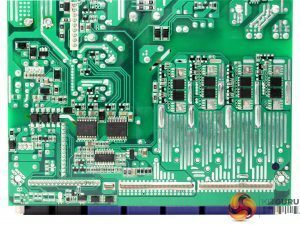 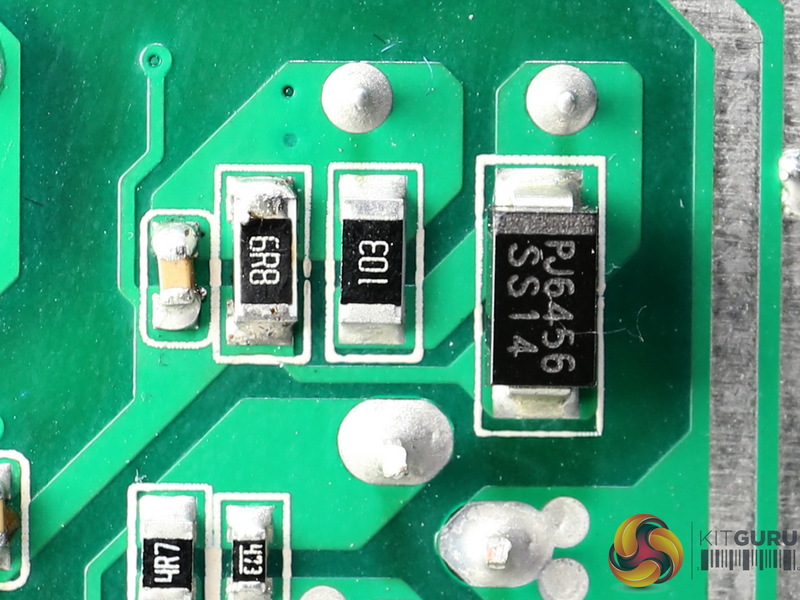 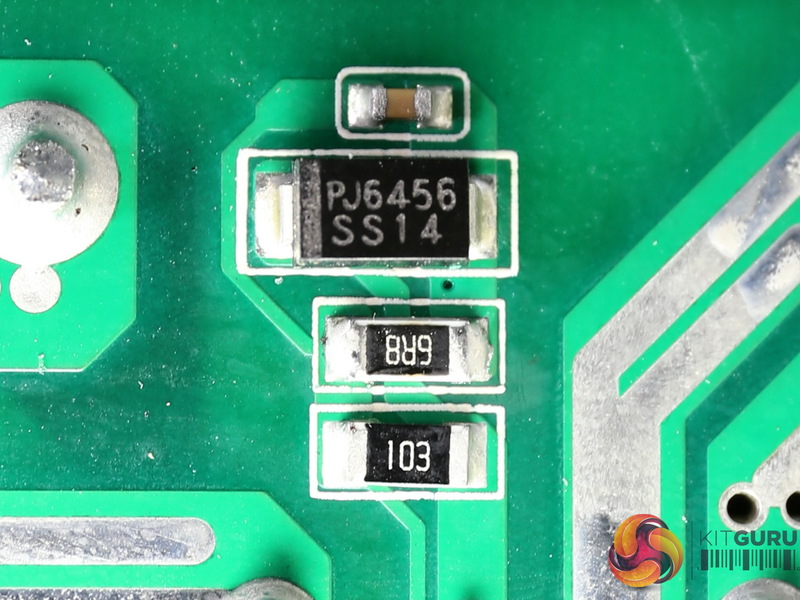 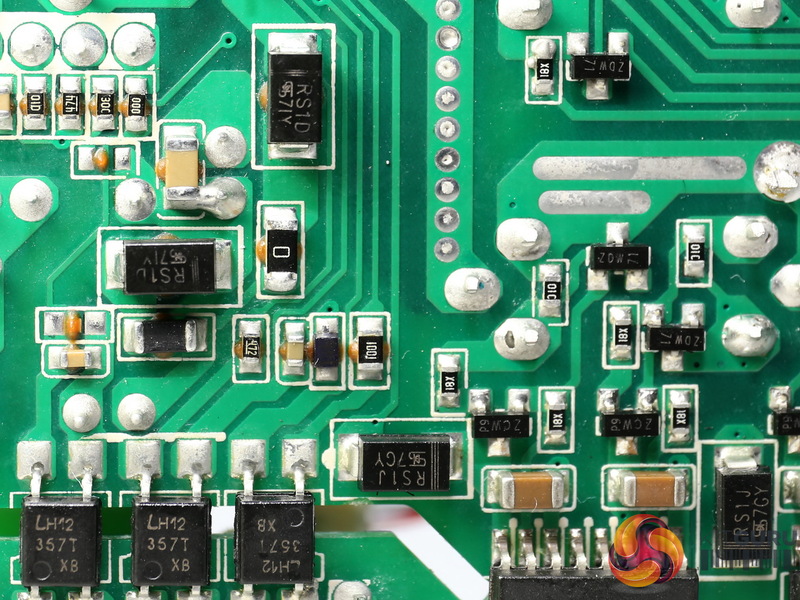 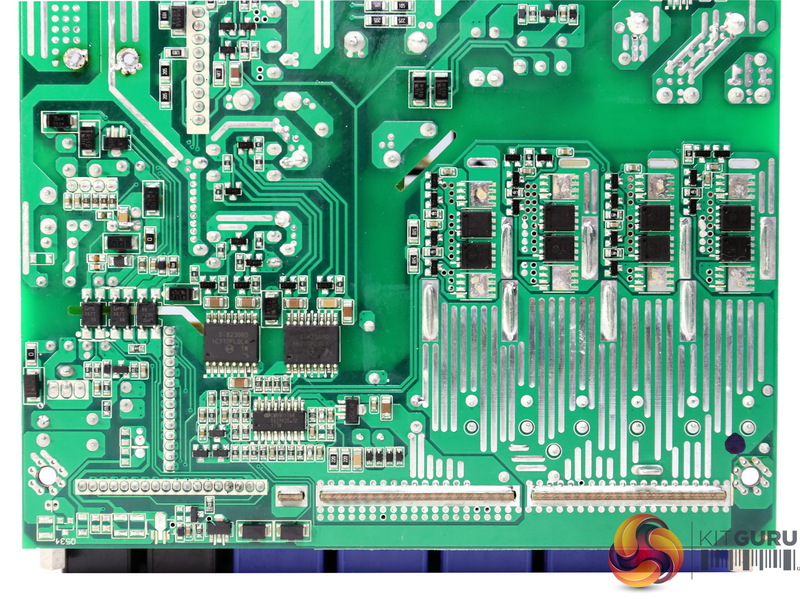 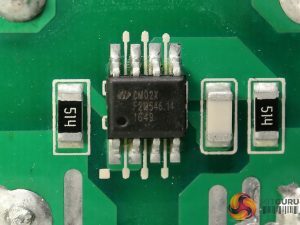 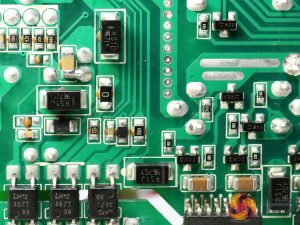 Those FETs are installed on the solder side of the PCB and are mostly cooled by the chassis, with a thermal pad providing the contact between the two. As you can see in the photo above, there is room for eight more FETs, space which is utilised in the 1500W Strider Titanium model. 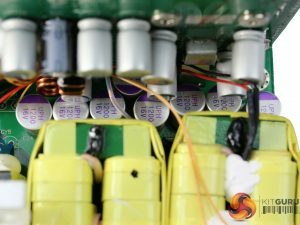 Mostly polymer caps handle the ripple filtering on the secondary side, with a few electrolytic ones providing the necessary capacity and the ESR as well, which helps with avoiding unwanted oscillations. 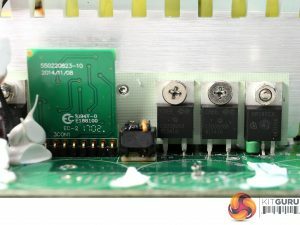 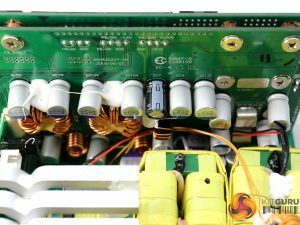 The voltage regulation modules that handle the minor rails, are installed onto a large PCB right behind the modular board. 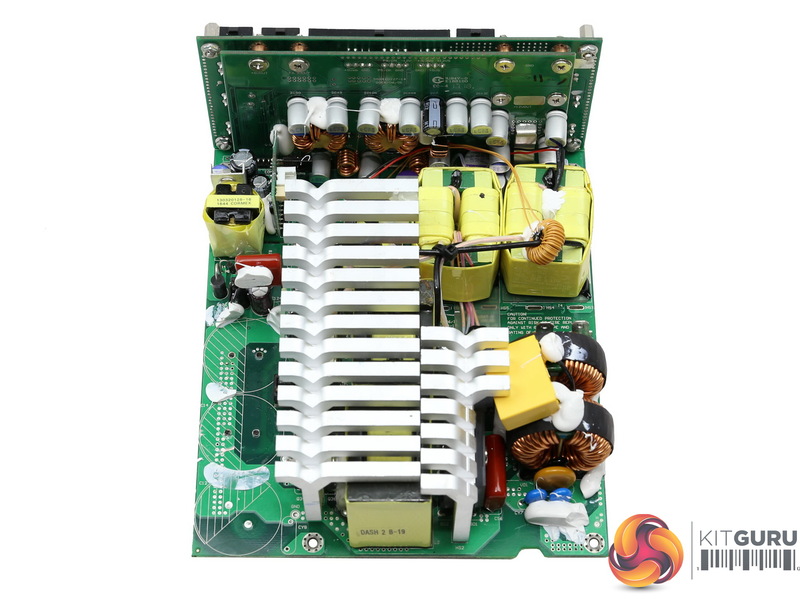 The 5VSB circuit is rectified by a PFR10V45CT SBR and the standby PWM controller is a Sanken STR-A6062H. 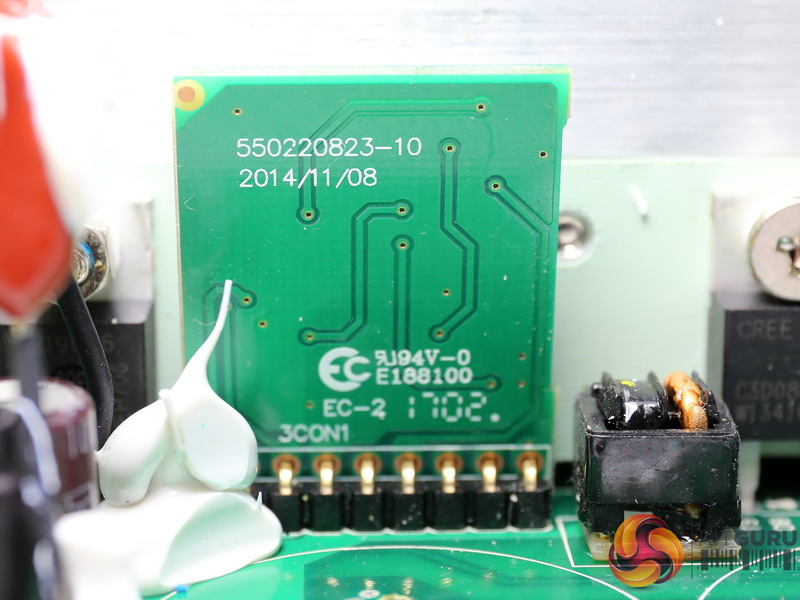 Above we can see the fan speed control board. At the front of the modular board, several Sun’con electrolytic caps are installed. The soldering quality is very good – Enhance has a solid reputation in this area. 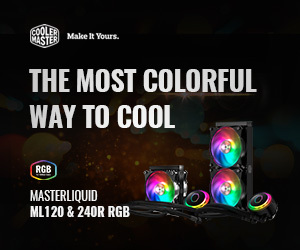 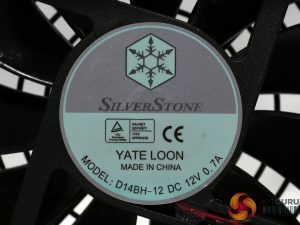 The cooling fan is by Yate Loon and its model number is D14BH. 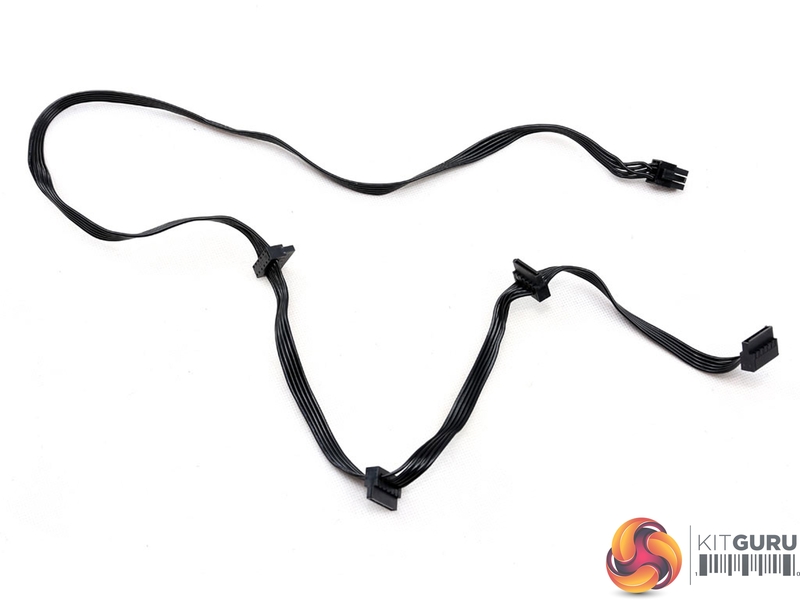 It uses a double ball bearing, so it will easily cope with tough conditions. 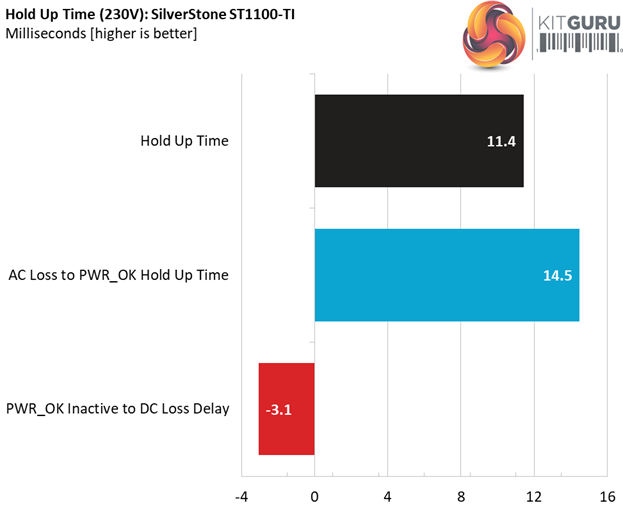 The hold-up time is much lower than 17ms and to make matters even worse, the power ok signal is inaccurate. 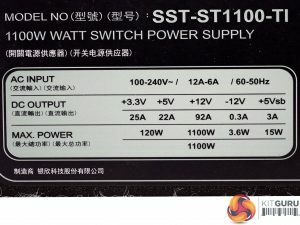 We don’t want to see a “fake” power ok signal in any PSU, especially a high-end one. 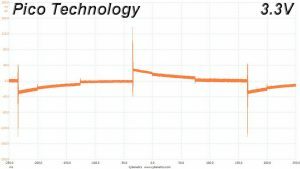 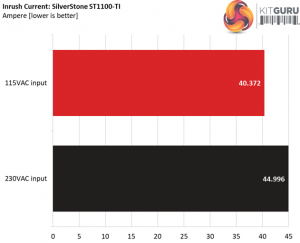 SilverStone should coordinate with Enhance Electronics and fix this problem – the sooner the better. 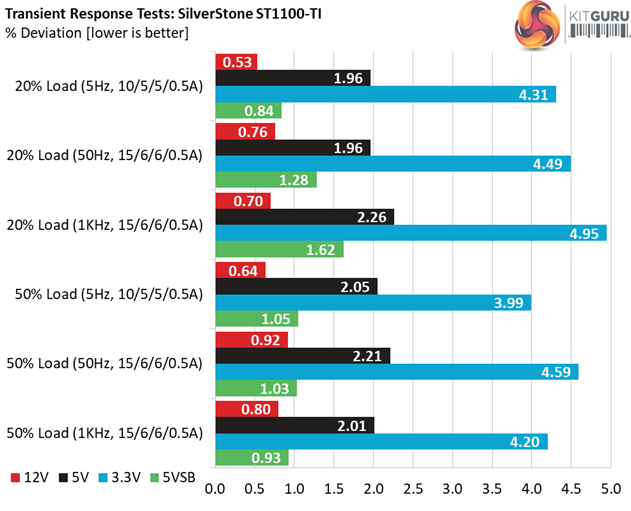 The first set of tests reveals the stability of the voltage rails and the ST1100-TI’s efficiency. 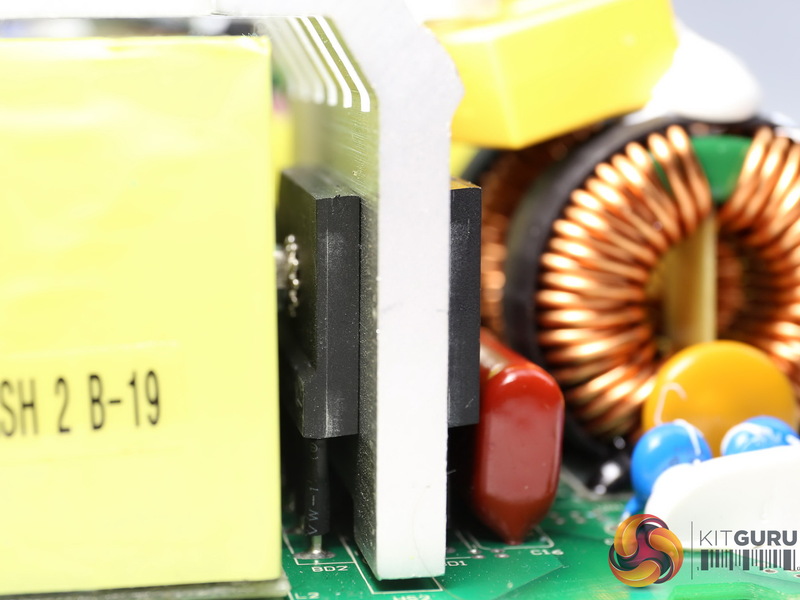 The applied load equals (approximately) 10 to 110 percent of the power supplies maximum load in increments of 10 percentage points. We conducted two additional tests. 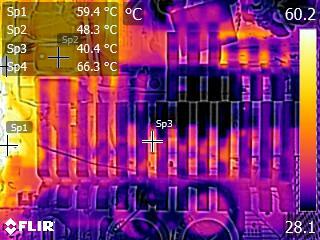 During the first, we stressed the two minor rails (5V and 3.3V) with a high load, while the load at +12V was only 0.1A. This test reveals whether a power supply is compatible with Intel’s C6/C7 sleep states or not. In the second test, we determined the maximum load the +12V rail could handle with minimal load on the minor rails. 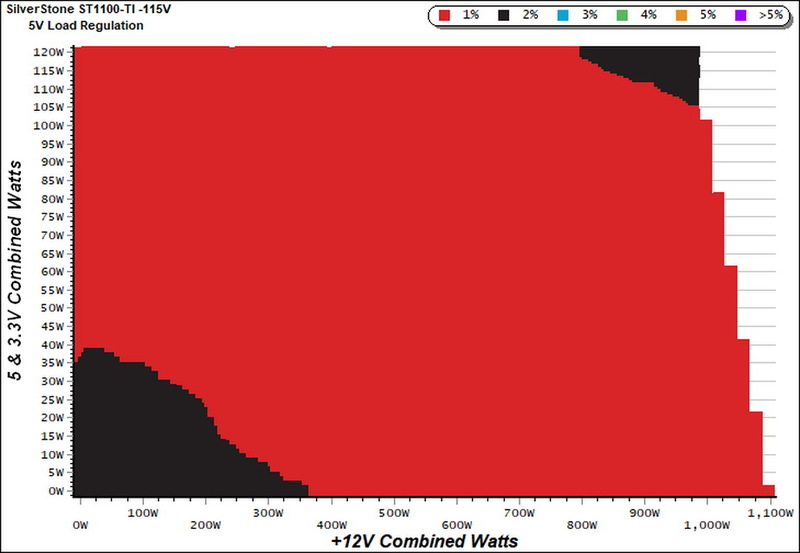 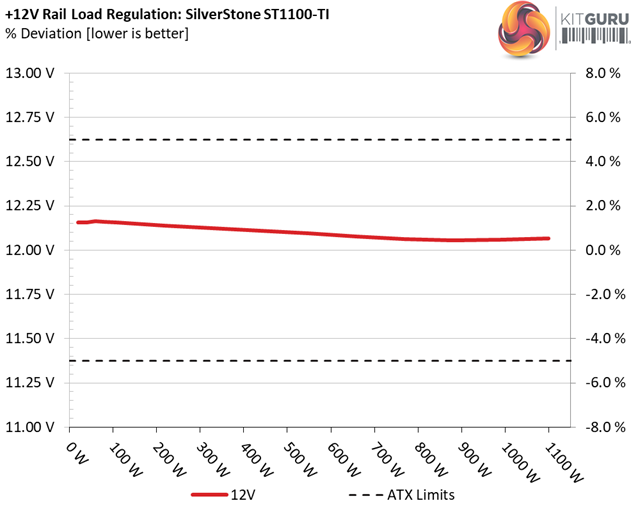 With 110% load, where we push the power supply beyond its official limits, the +12V rail’s load regulation gets ugly. 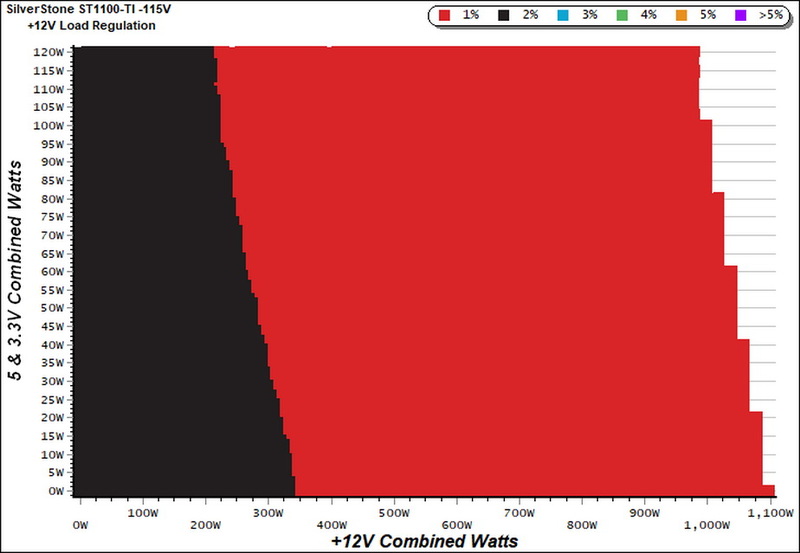 The huge voltage drop is a clear indication that 95.2A of current on this rail is way too much. 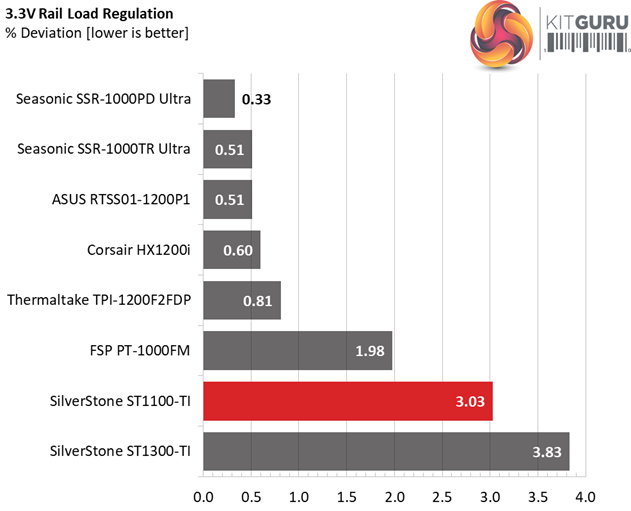 Although we exceed the platform’s capabilities, as we already stated, we still expected it to easily handle a 110% overload, like the majority of similar capacity units. 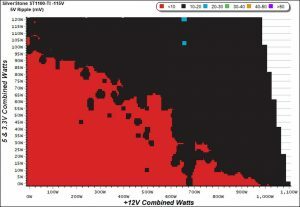 If you don’t exceed its max current output, the +12V rail offers tight enough load regulation, while the minor rails fail to impress since several of the competing offerings perform better. 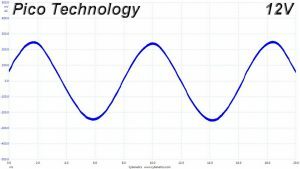 Obviously, Enhance Electronics in its effort to achieve the highest possible efficiency, didn’t pay much attention on the performance of the minor rails. 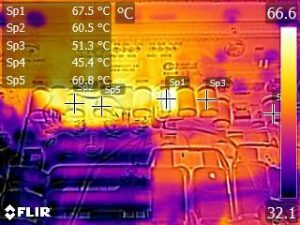 Speaking of efficiency, the unit manages to meet three out of the four 80 PLUS Titanium requirements, even at the very high ambient temperature that we apply. Up to the fifth load test the fan spins at low speeds, offering silent operation. During test #6 the cooling fan suddenly gets crazy and doubles its speed with the acoustics noise reaching 46 dB(A), which is very loud. 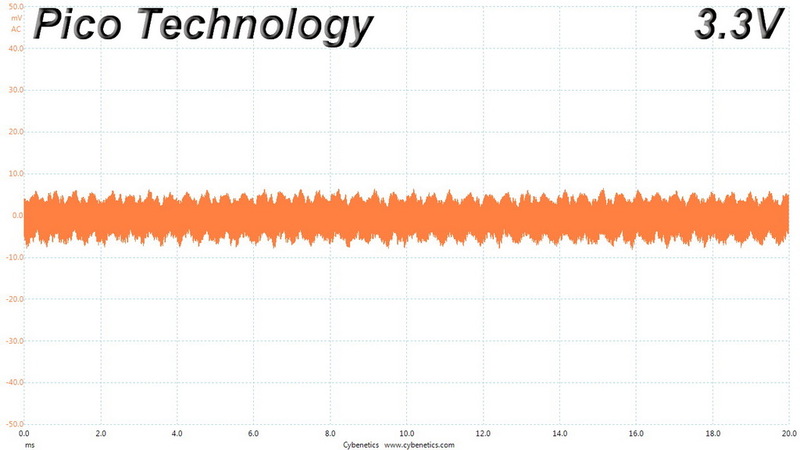 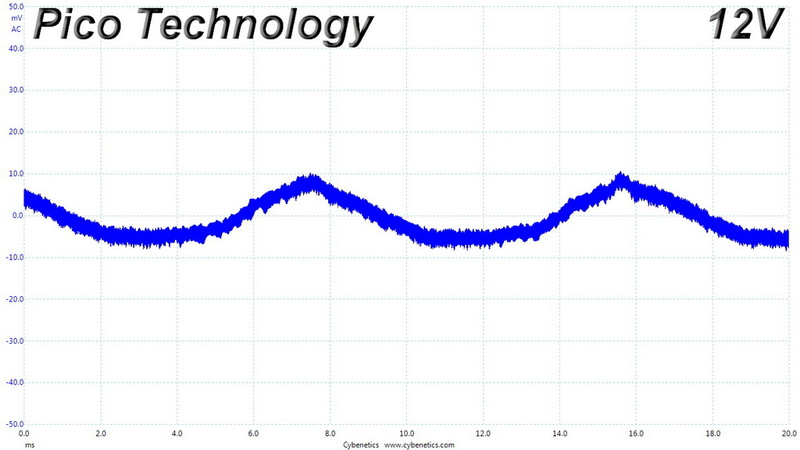 But it gets even louder at higher loads, at close to 49 db(A). 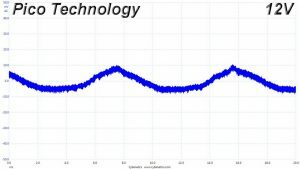 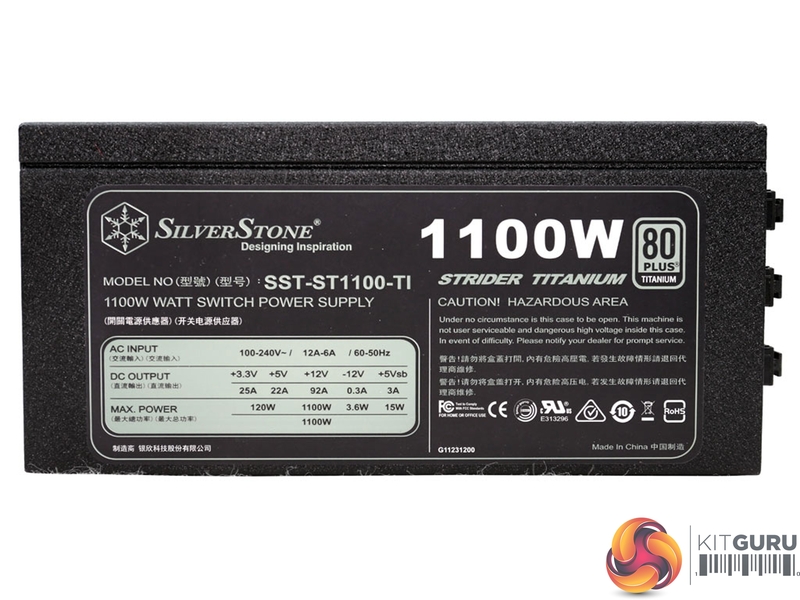 We don’t expect a 1.1kW power supply to be whisper quiet, but we don’t want to encounter such high noise output either, once it comes under high load. 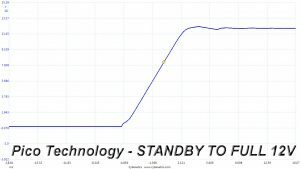 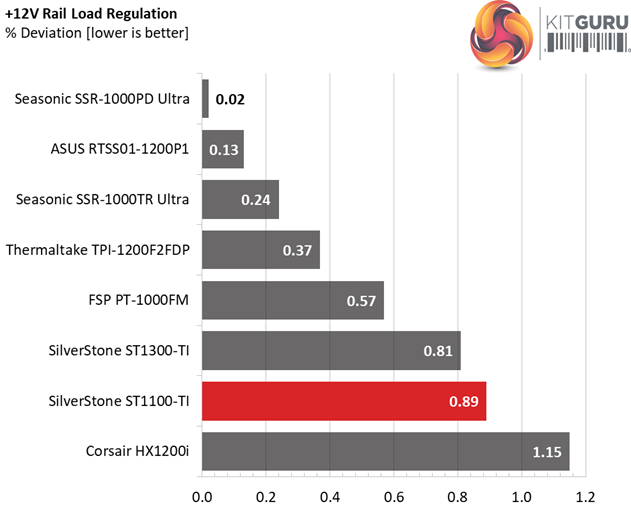 Using results from the previous page, we plotted a chart showing the ST1100-TI’s efficiency at low loads, and loads from 10 to 110 percent of its maximum-rated capacity. 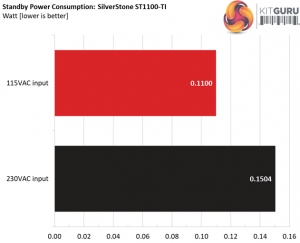 With normal loads the ST1100-TI only loses to the superb Seasonic Prime Titanium, which has 100W less capacity. 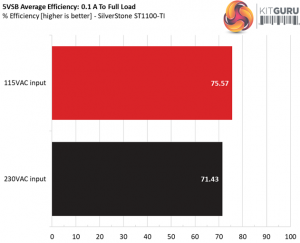 The efficiency levels are not so impressive though under light loads, where SilverStone’s offering comes in third place from bottom. 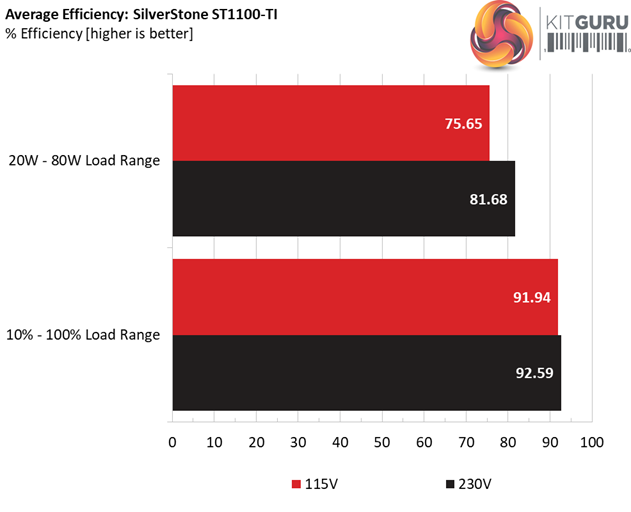 In the following tests, we measure the ST1100-TI’s efficiency at loads significantly lower than 10 percent of its maximum capacity (the lowest load the 80 PLUS standard measures). 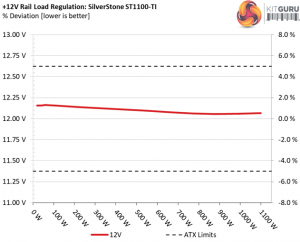 The loads we dial are 20, 40, 60, and 80W. 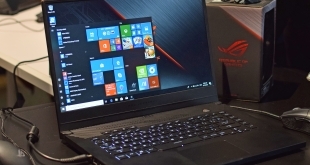 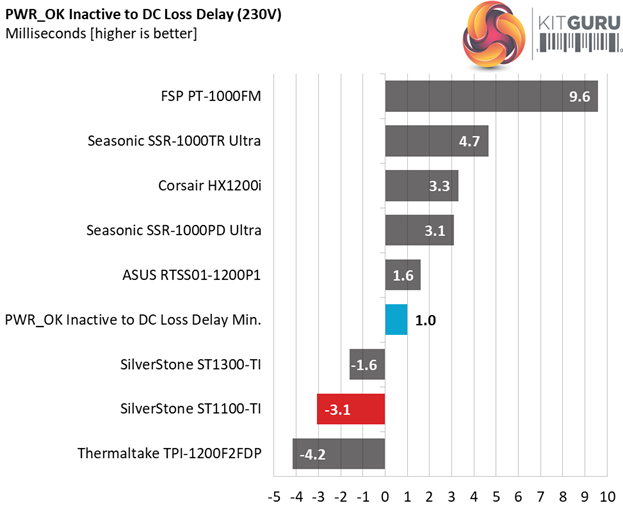 This is important for representing when a PC is idle, with power-saving features turned on. 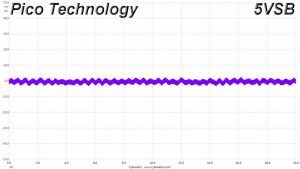 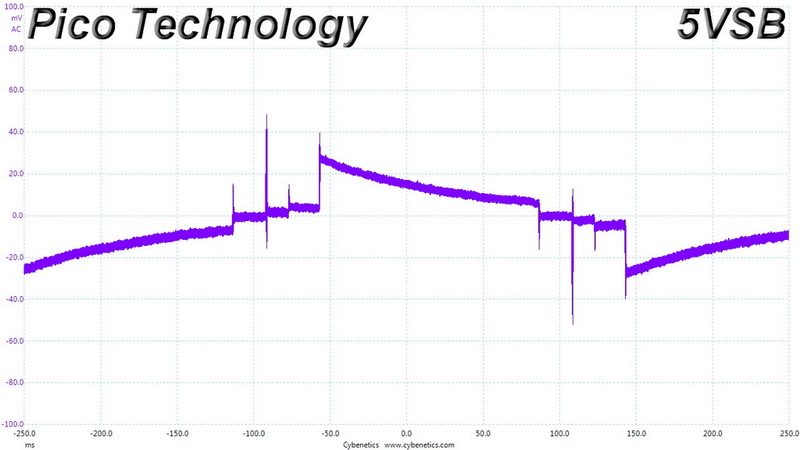 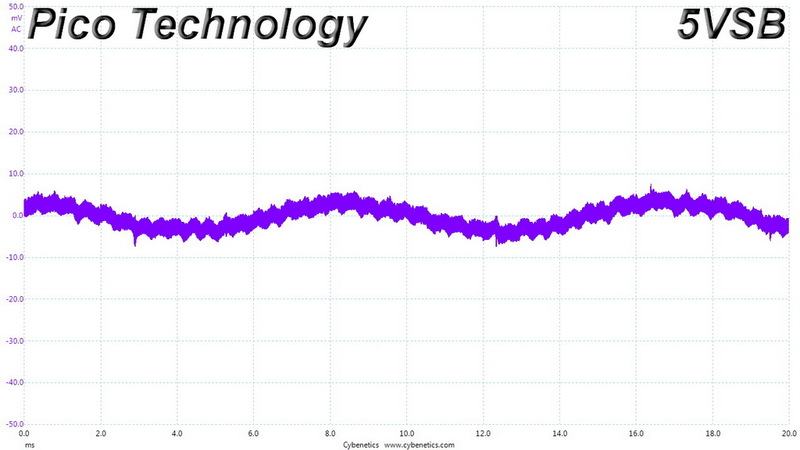 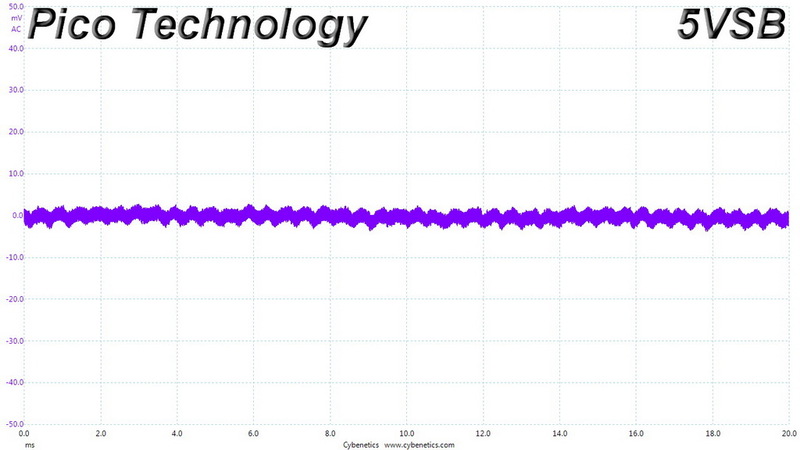 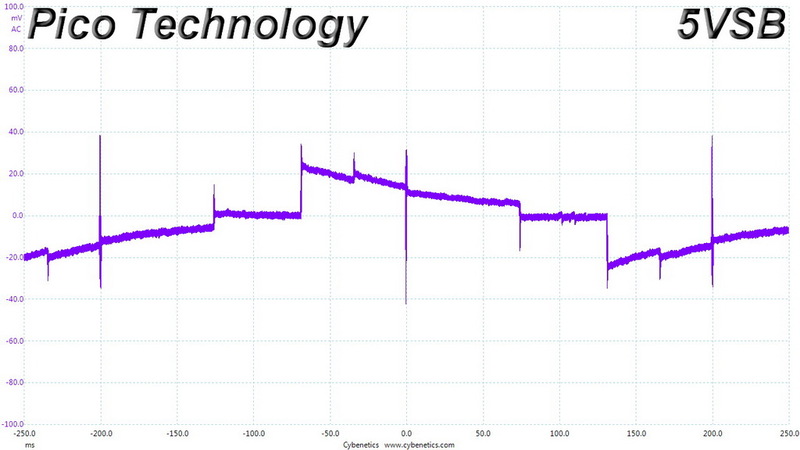 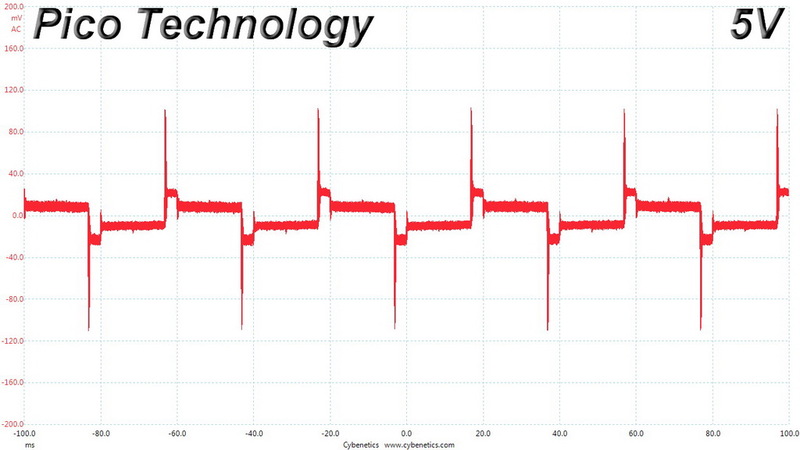 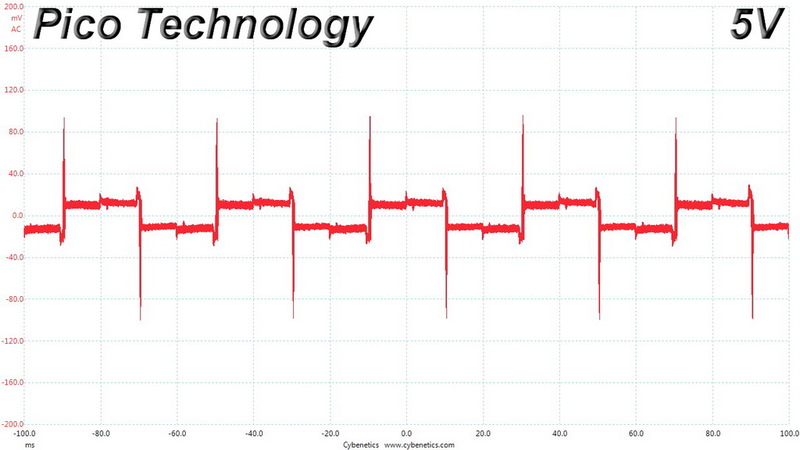 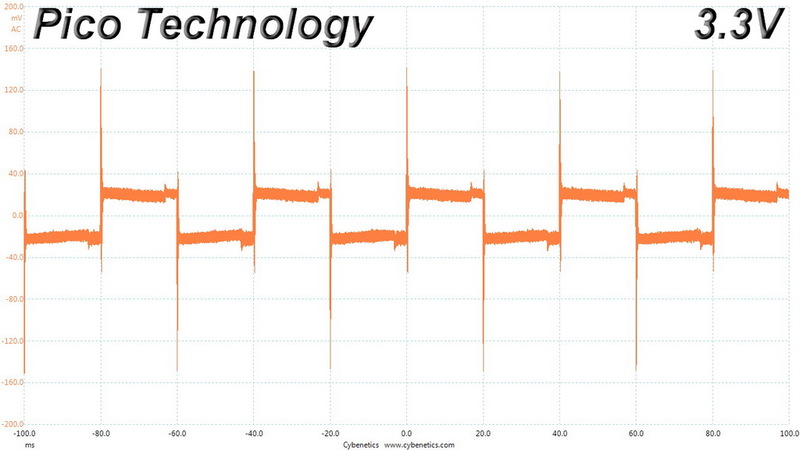 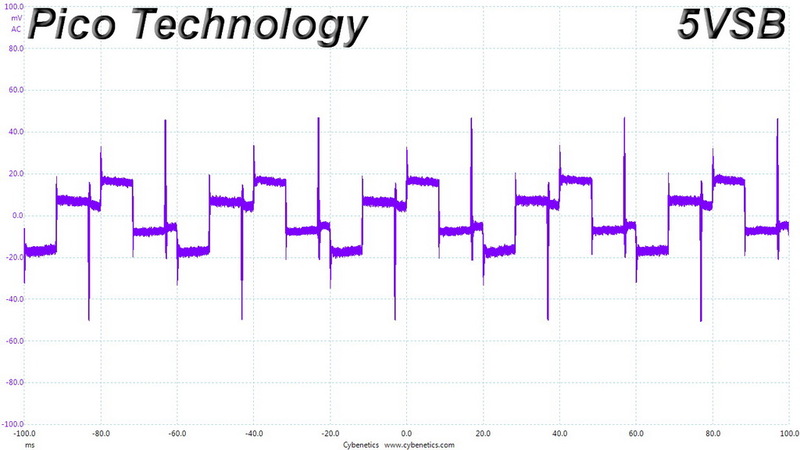 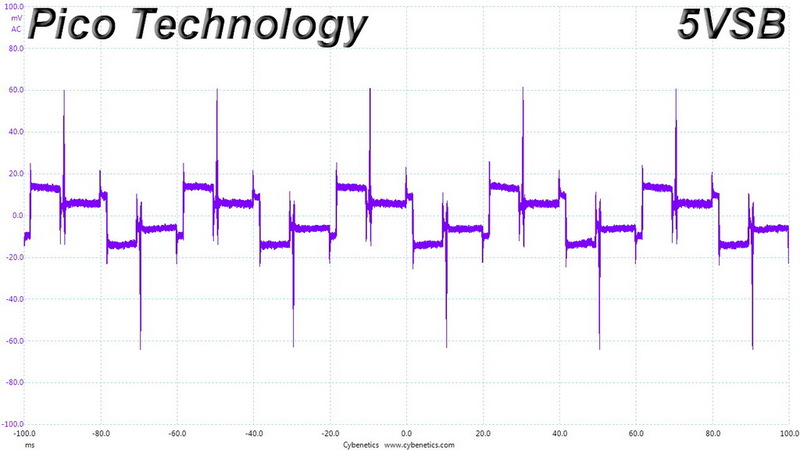 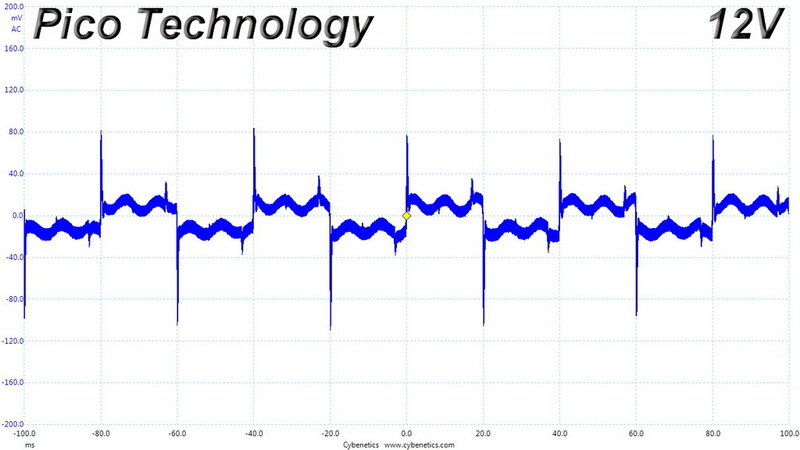 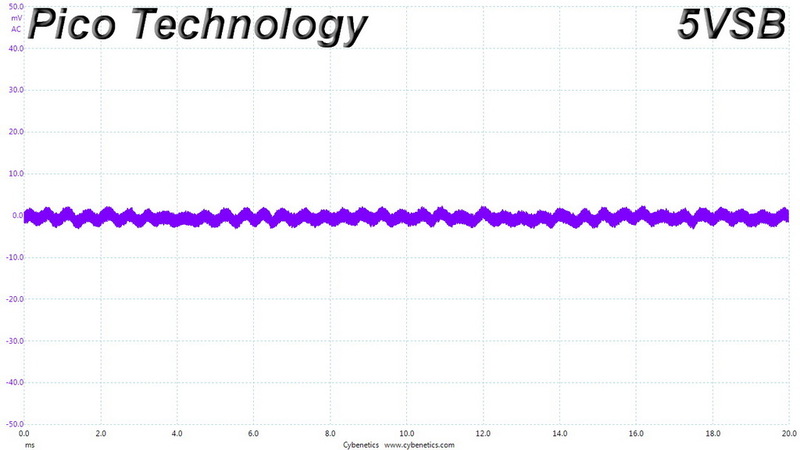 The efficiency levels during the first two tests are very low, showing that Enhance should probably adjust the burst mode of the LLC resonant converter, in order to achieve higher efficiency levels under such light loads. We take six measurements: one each at 100, 250, 550, 1000, and 1500mA, and one with the maximum load the 5VSB rail can handle. 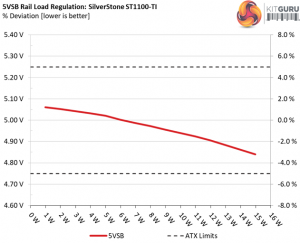 The 5VSB rail is not that efficient, when compared to other high-end platforms at least. The vampire power levels are increased, with both 115V and 230V input. 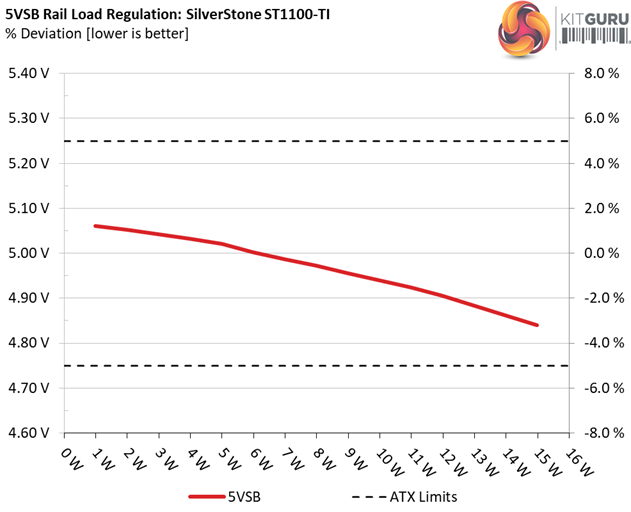 This affects of course the 5VSB rail’s efficiency under very light loads. 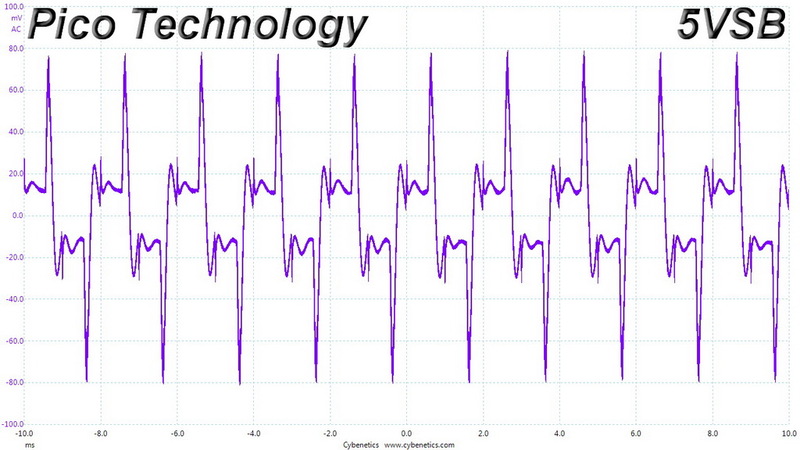 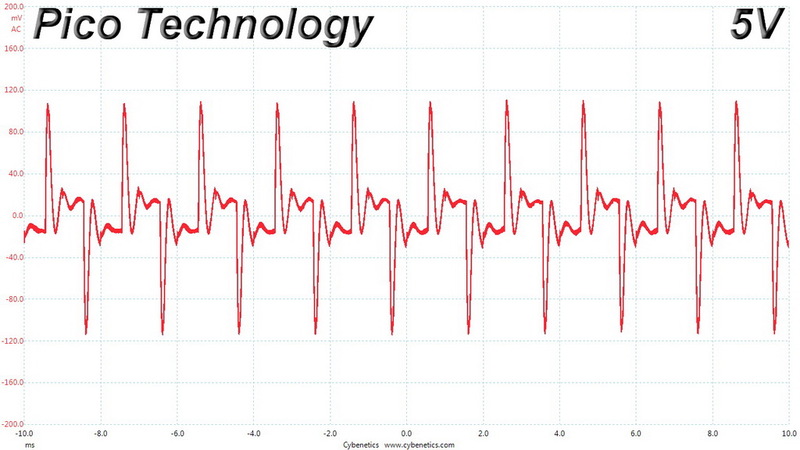 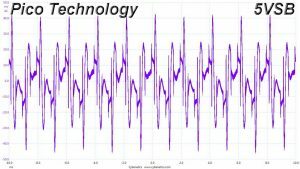 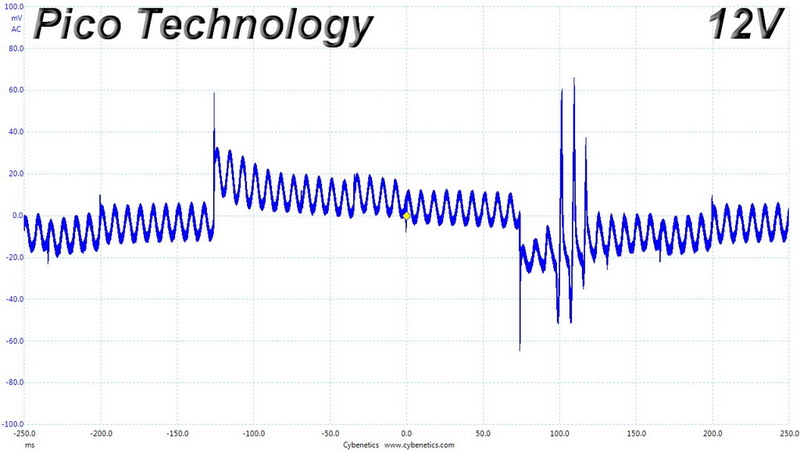 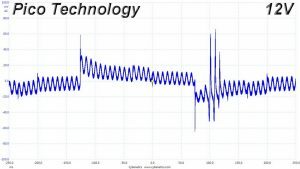 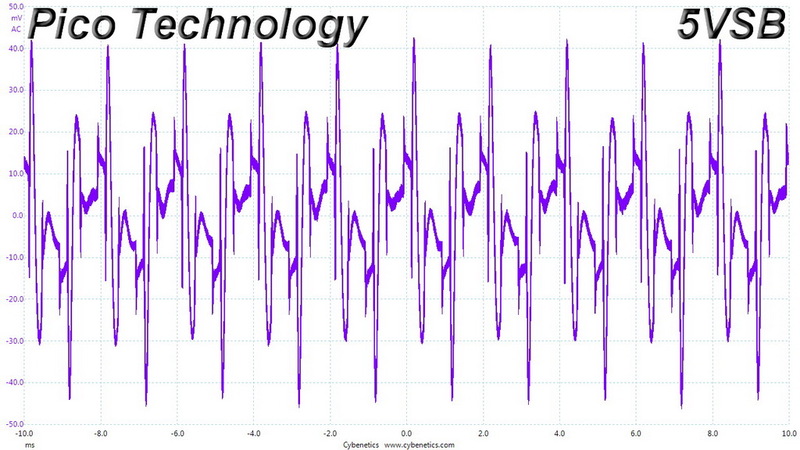 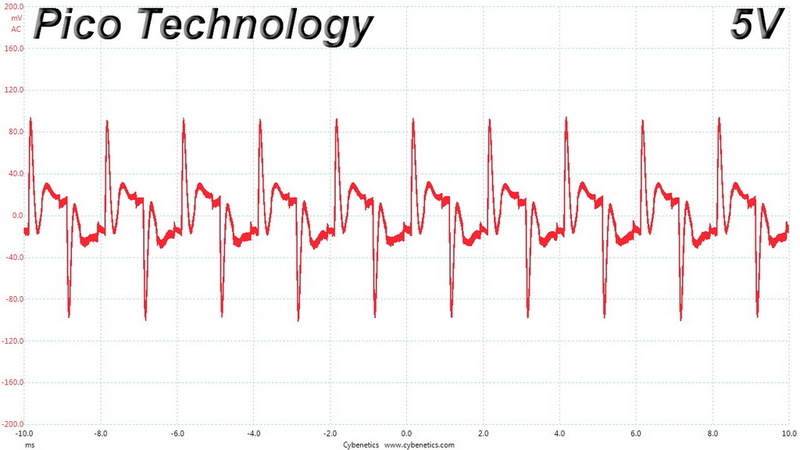 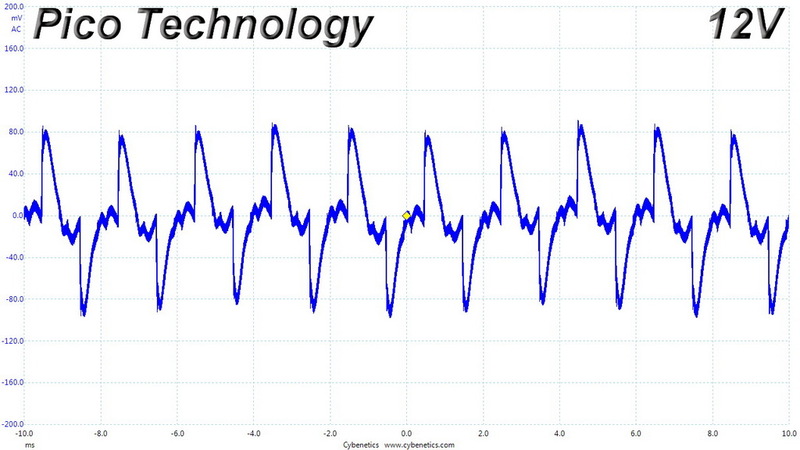 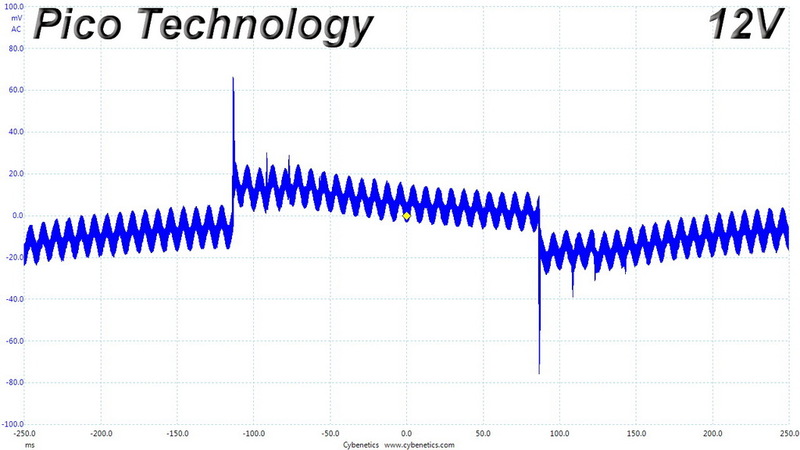 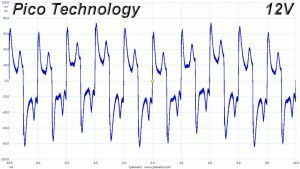 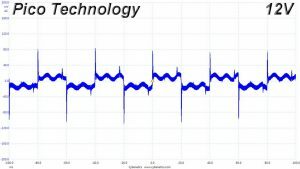 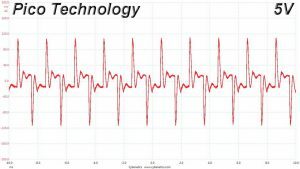 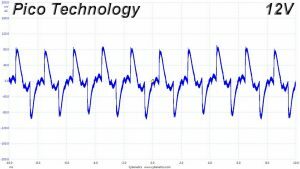 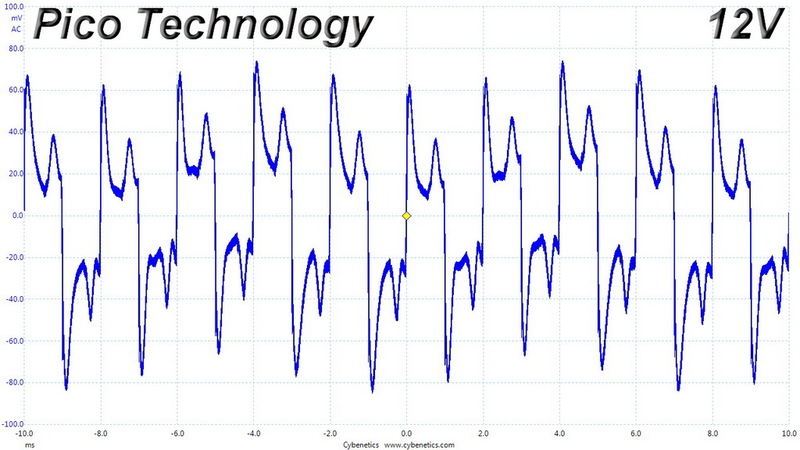 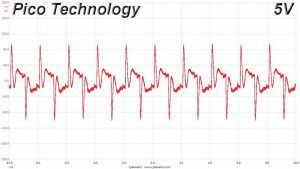 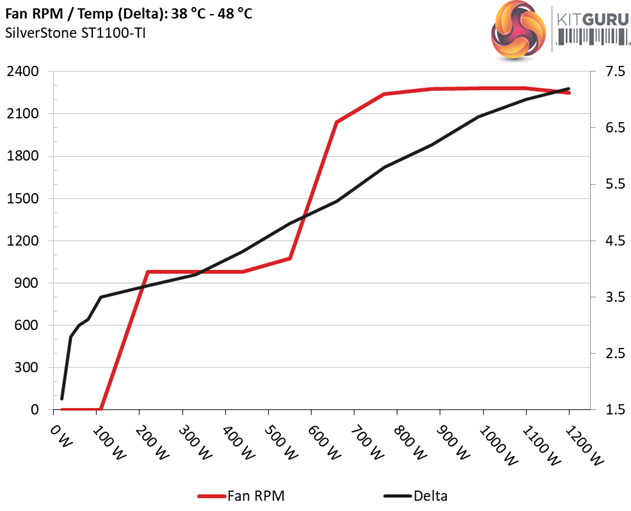 The first chart below illustrates the cooling fan’s speed (in RPM), and the delta between input and output temperature. 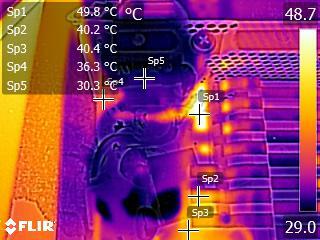 The results were obtained at 38°C (100.4°F) to 48°C (118.4°F) ambient temperature. 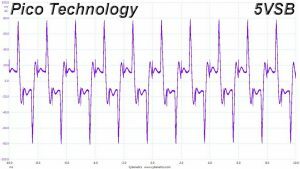 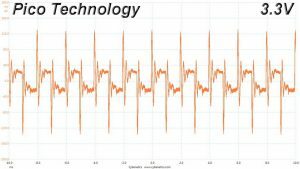 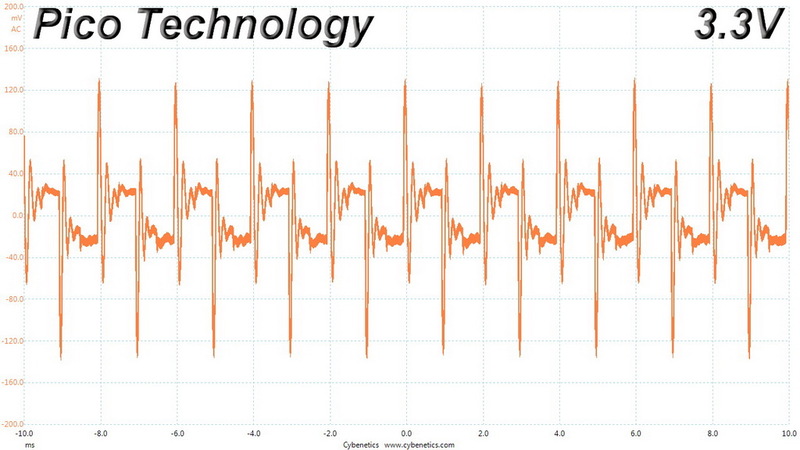 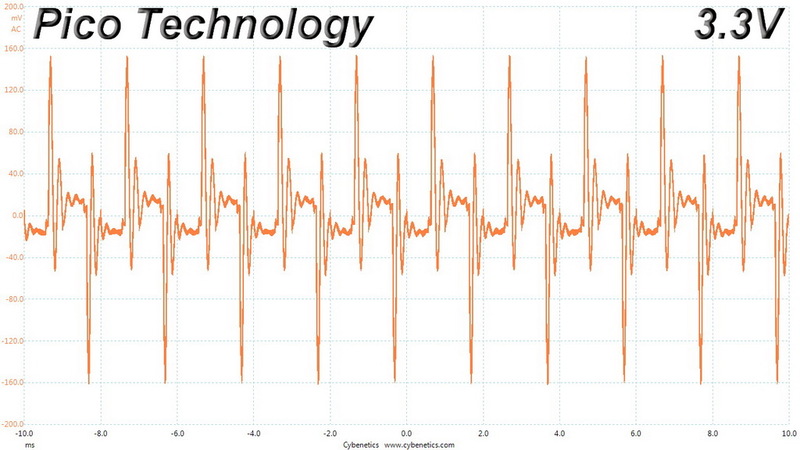 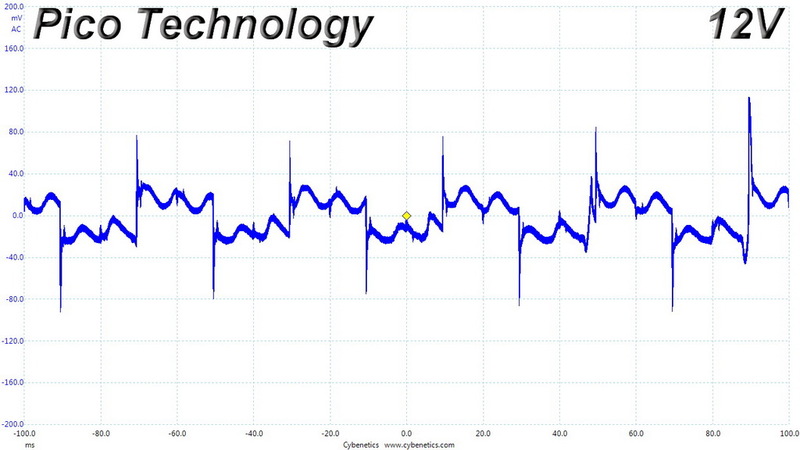 The next chart shows the cooling fan’s speed (again, in RPM) and output noise. We measure acoustics from one meter away, inside a hemi-anechoic chamber. 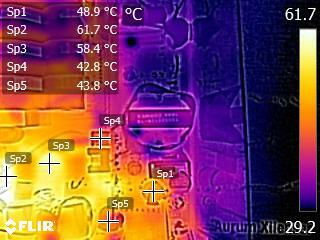 Background noise inside the chamber is below 6 dB(A) during testing (it’s actually much lower, but our sound meter’s microphone hits its floor), and the results are obtained with the PSU operating at 38°C (100.4°F) to 48°C (118.4°F) ambient temperature. 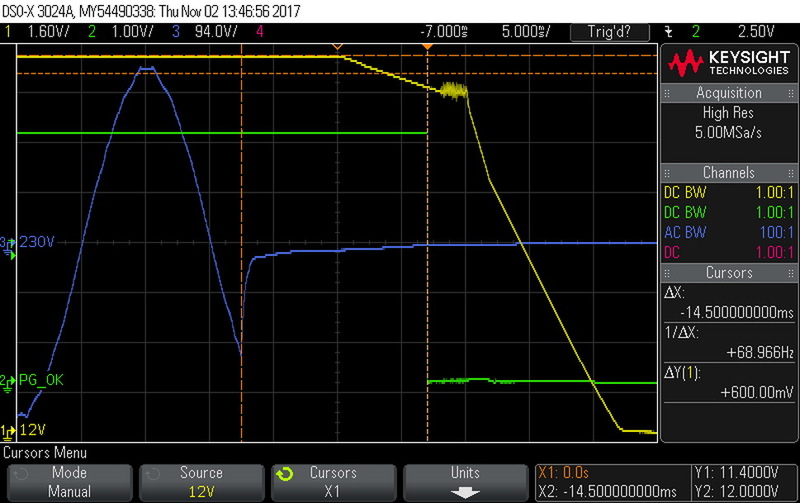 The semi-passive mode doesn’t last long and as the graph above shows, it doesn’t take into account the load on the minor rails but only the load at +12V. 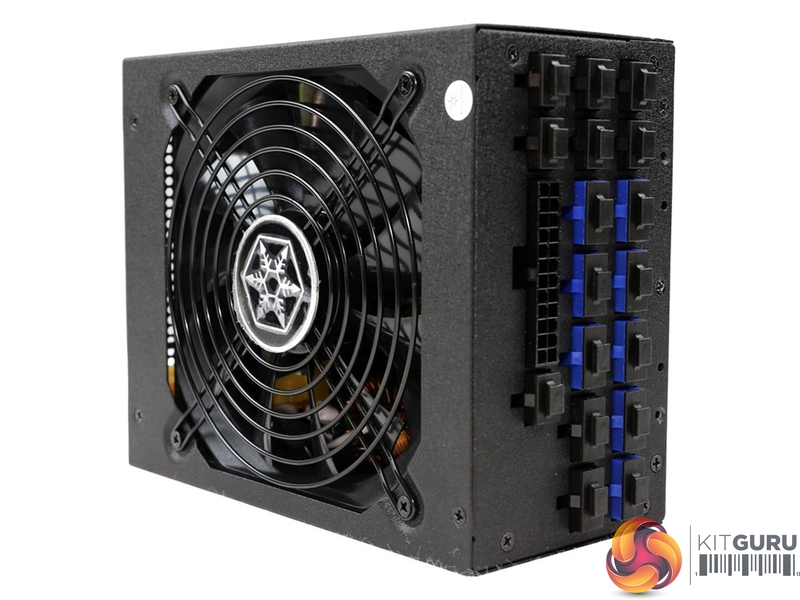 Up to 690W the noise is within the 25-30 dB(A) range but with loads exceeding 700W, it climbs above 40 dB(A). Finally, with over 810W load +12V you will probably need ear plugs to cope with the noise as it exceeds 45 dB(A). 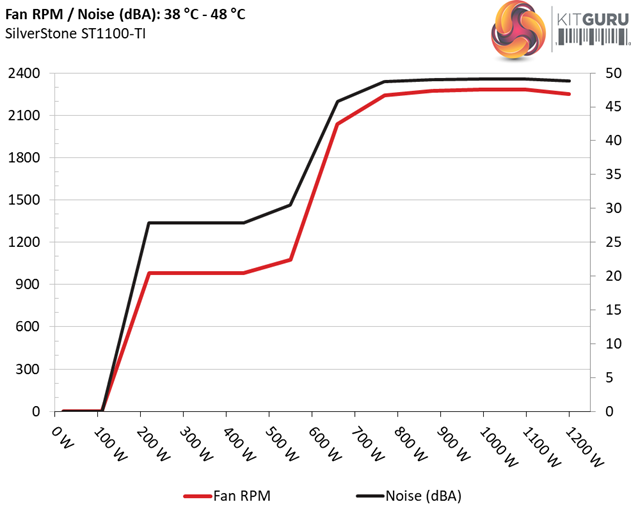 This is a shame because this platform is highly efficient, so the fan speed profile could be tuned better to allow for a much quieter operation, especially at high loads. 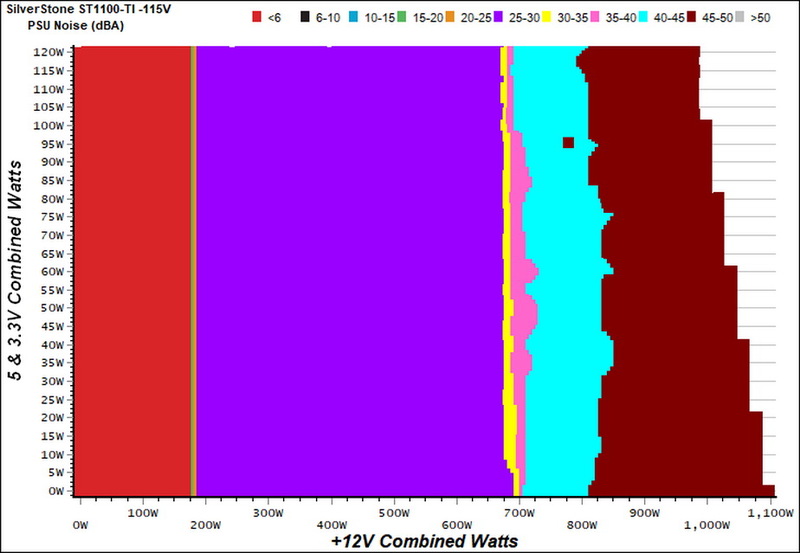 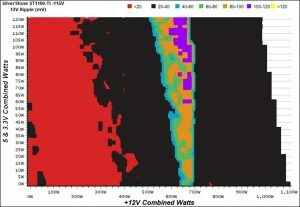 The OCP triggering points at +12V and 5V are quite low, while at 3.3V it is sky high allowing the voltage to drop as low as 3.11V. 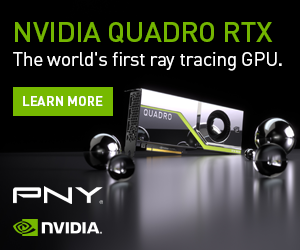 Obviously this needs to be fixed. 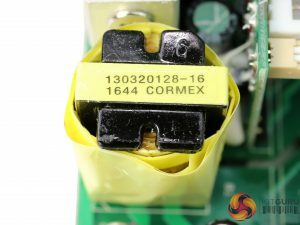 The unit’s OPP is set at 1368.84W and given the problems that the +12V rail faces at high loads, this is above the platform’s capabilities. 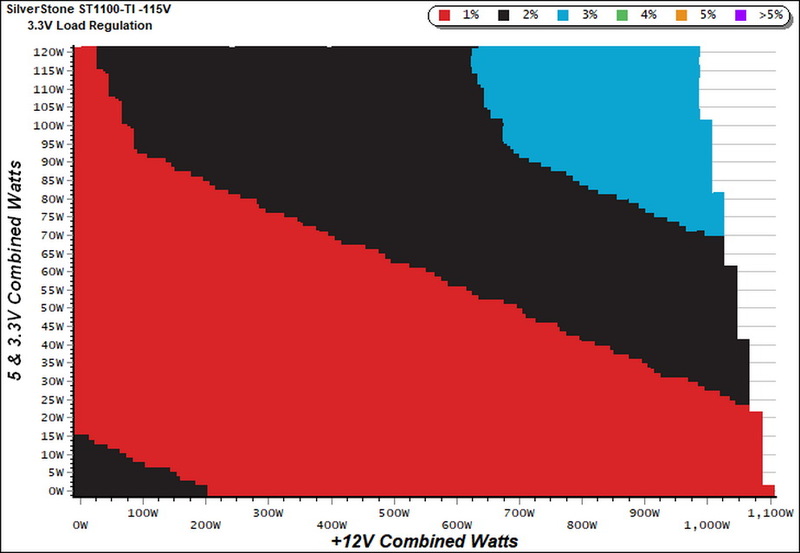 For the moment, though, a 130% OPP threshold is ideal, so Enhance Electronics should fix the +12V rail’s performance issues when dealing with load over 95 Amps. 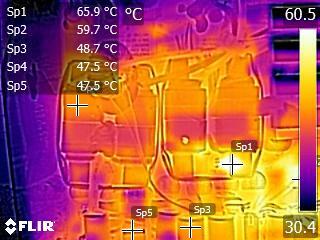 The over temperature protection is also working well and there is short circuit protection on all rails. 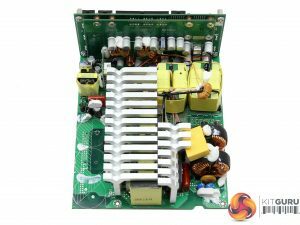 Unfortunately, as we mentioned the power ok signal is not accurate, which is a shame especially for a high-end product like this one. 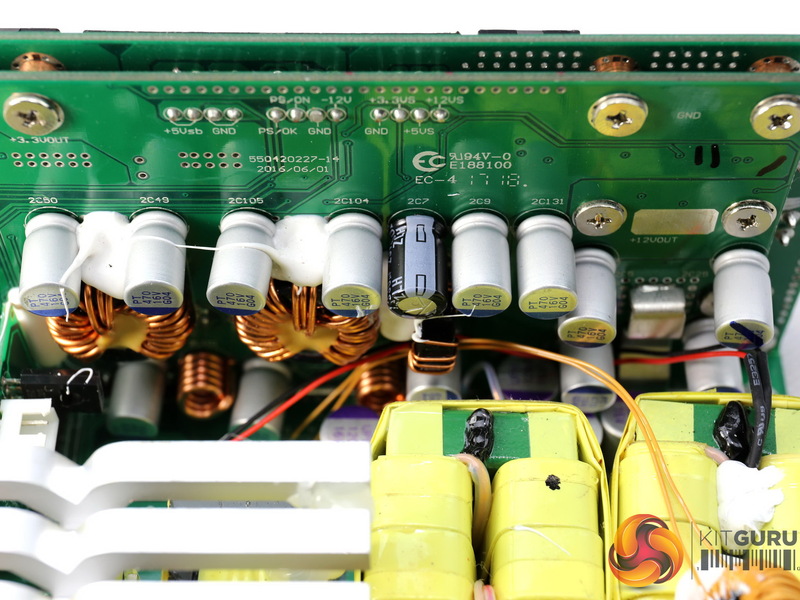 Lastly, there is an MOV providing protection against spikes coming from the mains grid and an NTC thermistor along with a bypass relay to protect from large inrush currents. 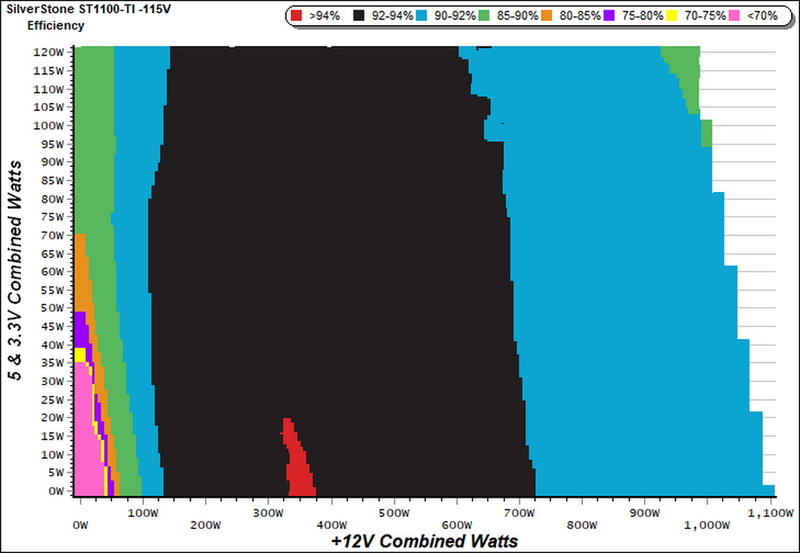 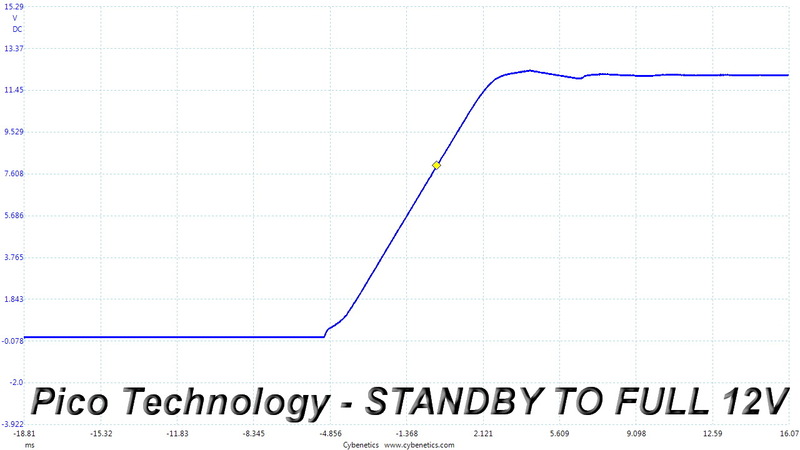 To generate the following charts, we set our loaders to auto mode through our custom-made software before trying more than 1500 possible load combinations with the +12V, 5V, and 3.3V rails. 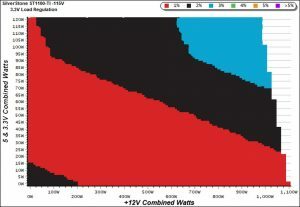 The load regulation deviations in each of the charts below are calculated by taking the nominal values of the rails (12V, 5V, and 3.3V) as point zero. The ambient temperature is between at 30°C (86°F) to 32°C (89.6°F). The region where the unit delivers between 92-94% efficiency is very large, however since this is a Titanium and ETA-A platform, we would like to see an even larger region with over 94% efficiency. 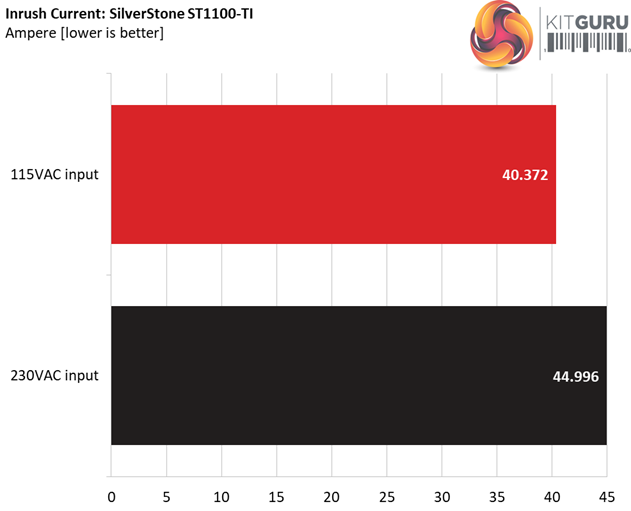 We are perhaps getting too picky, but this model belongs to SilverStone’s flagship line so we expect a lot. 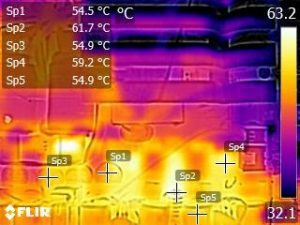 We apply half-load for 10 minutes with the PSU’s top cover and cooling fan removed before taking photos with our modified FLIR E4 camera that delivers 320×240 IR resolution (76,800 pixels). The temperatures in the internals stay low, so the fan speed profile could certainly be more relaxed. 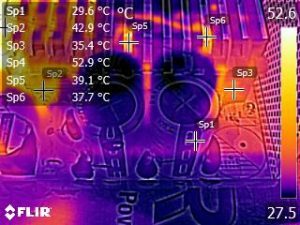 This is a highly efficient platform with highly restricted energy losses which don’t require high airflow even under heavy loads, but apparently Enhance wanted to be extra sure about this product’s reliability so it tuned the fan profile accordingly. We should note that the ATX spec requires for capacitive loading during the transient rests, but in our methodology we chose to apply the worst case scenario with no extra capacitance on the rails. 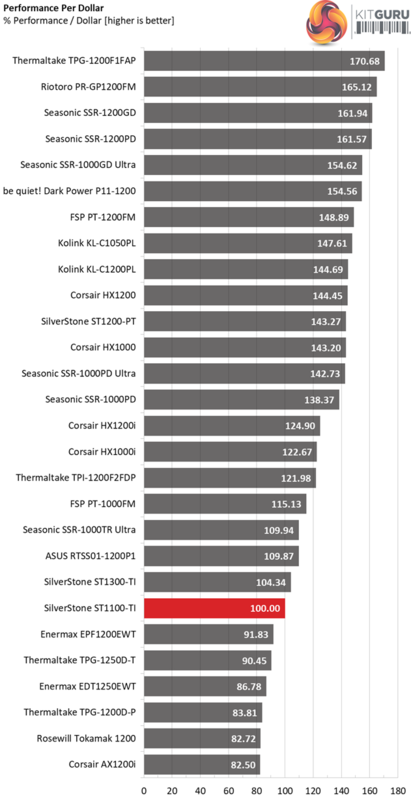 Although the ATX spec asks for this capacitance, this doesn’t mean that your system (meaning the mainboard and the rest of the parts) will provide it, so we have to keep this scenario in mind as well. 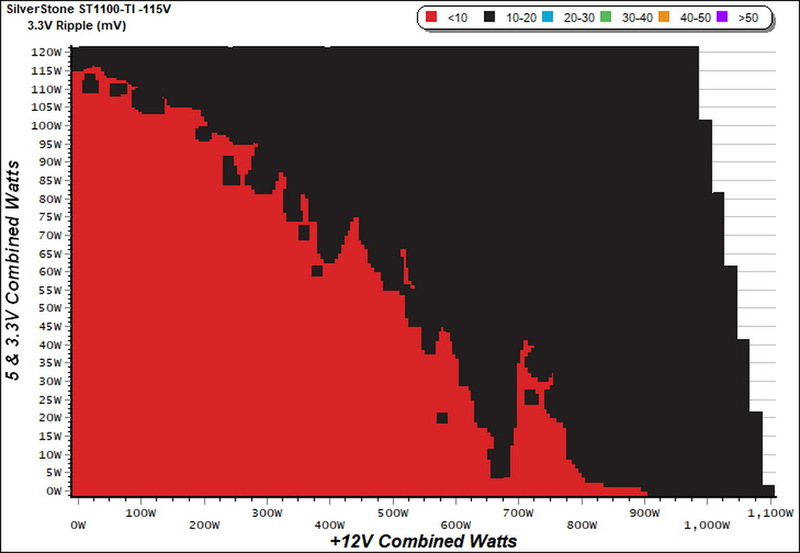 The transient response of the +12V rail is good and in line with the tough competition. The 5V and 5VSB rails perform quite well, however the 3.3V rail doesn’t follow and it drops its voltage very low in all of our tests, and it even fails in one of them. 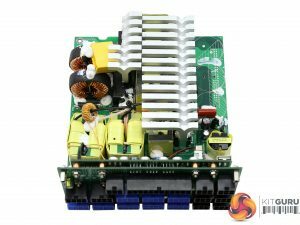 Normally this rail should be able to keep its voltage above 3.2V in all cases, even without the added capacity that the ATX spec requires, which actually helps the power supply perform better. 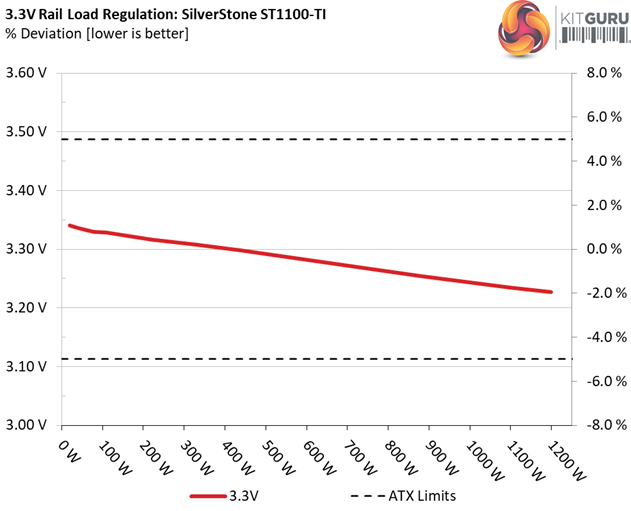 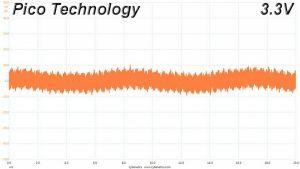 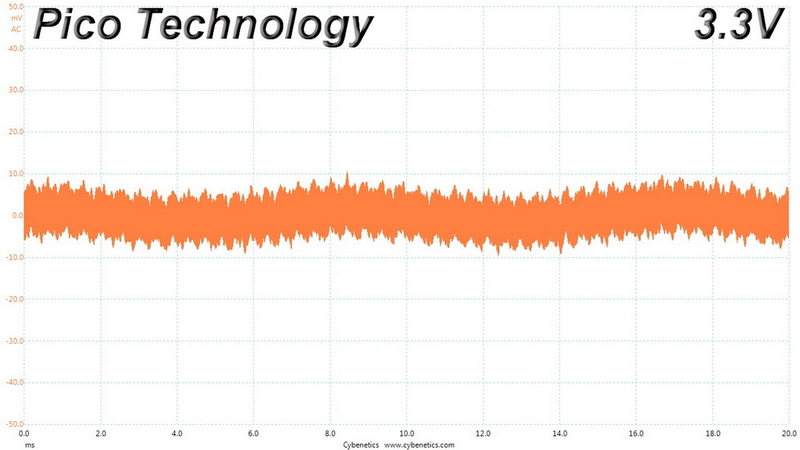 In the next set of tests, we measure the ST1100-TI’s response in simpler transient load scenarios—during its power-on phase. 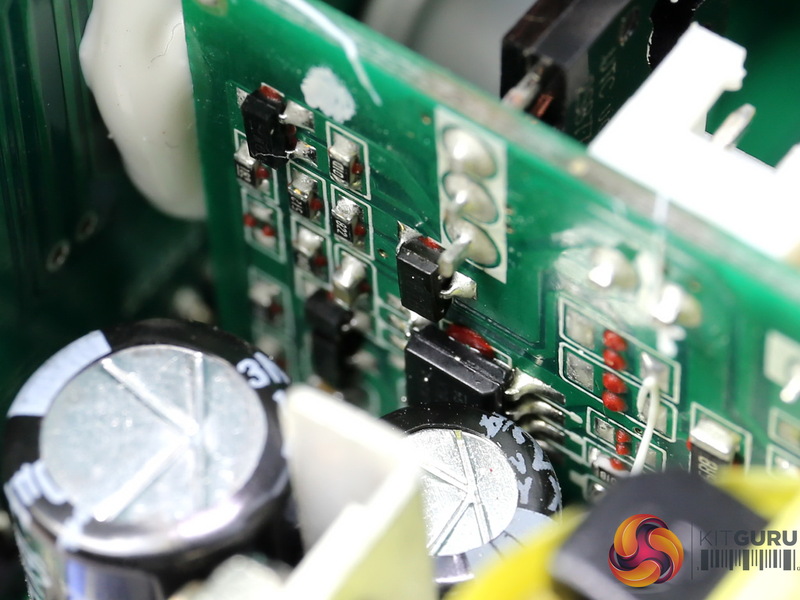 For our first measurement, we turn the unit off, dial in the maximum current the 5VSB rail can handle, and switch the PSU back on. 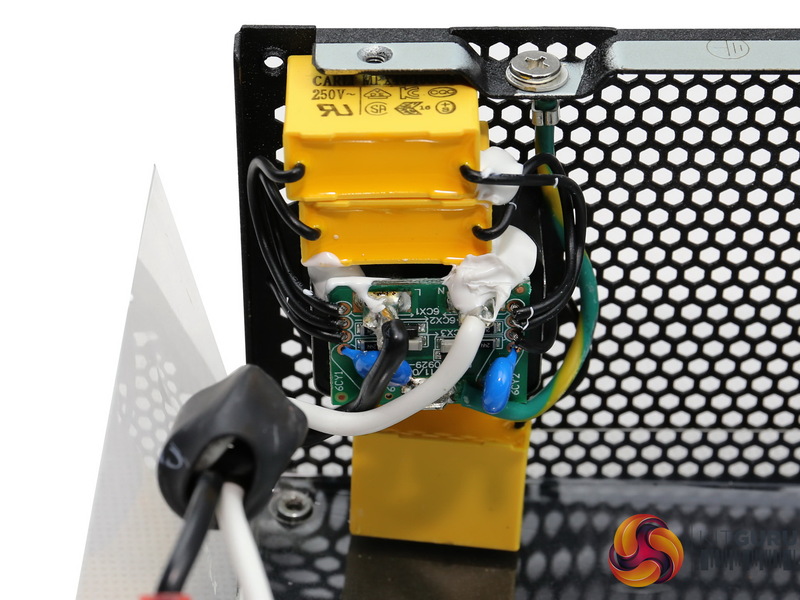 In the last test, while the PSU is completely switched off (we cut the power or switch the PSU off through its power switch), we dial the maximum load the +12V rail can handle before restoring power. 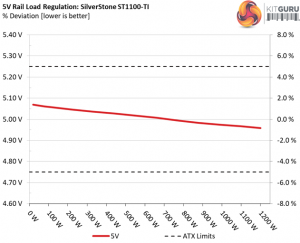 The ATX specification states that recorded spikes on all rails should not exceed 10 percent of their nominal values (+10 percent for 12V is 13.2V, and 5.5V for 5V). The voltage overshoot at 5VSB is notable, while in the second test the voltage overshoot is almost not existent. 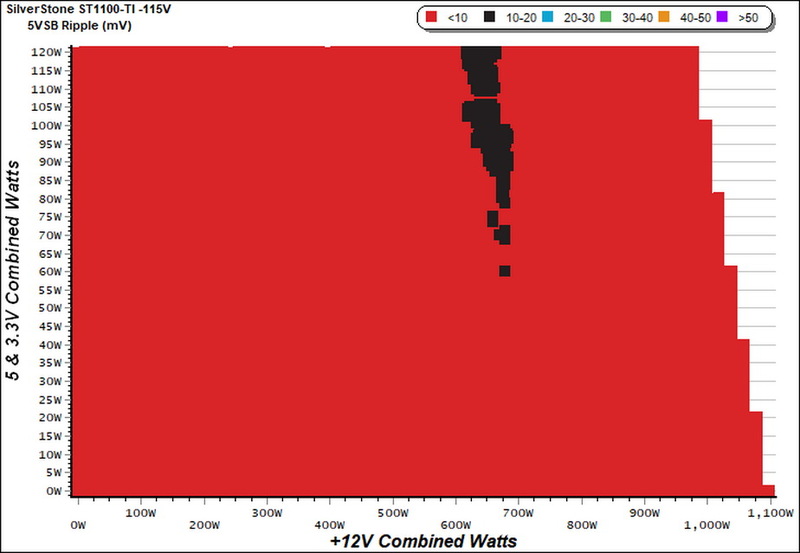 All hell seems to break loose in the third test, though, where we measure a huge voltage drop at +12V. 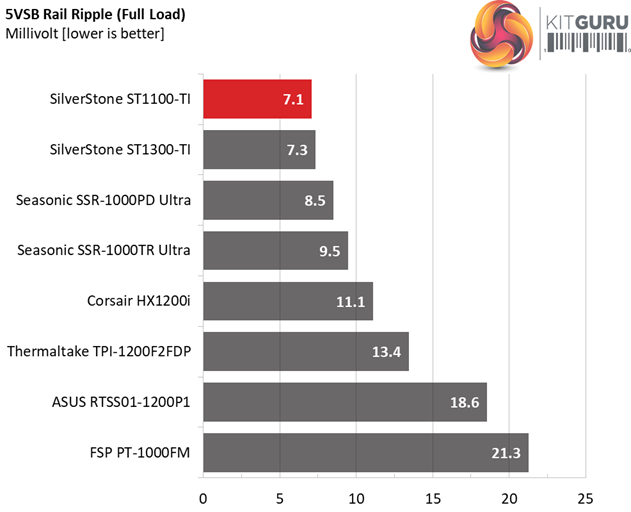 The following table includes the ripple levels we measured on the ST1100-TI’s rails. 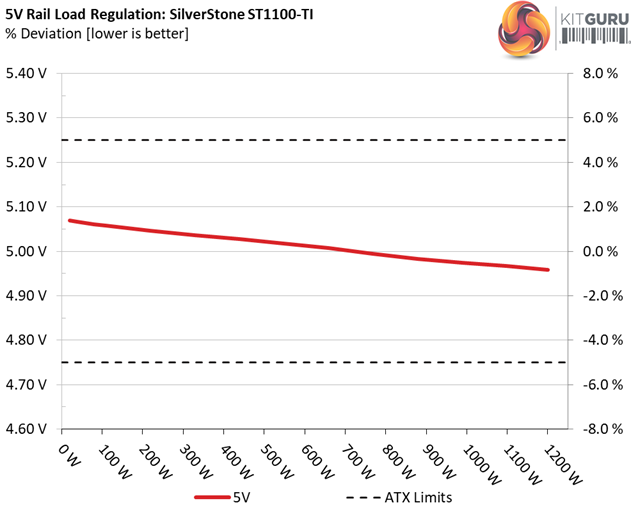 The limits, according to the ATX specification, are 120mV (+12V) and 50mV (5V, 3.3V, and 5VSB). 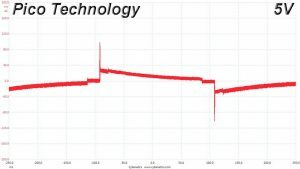 The ripple suppression is very good. 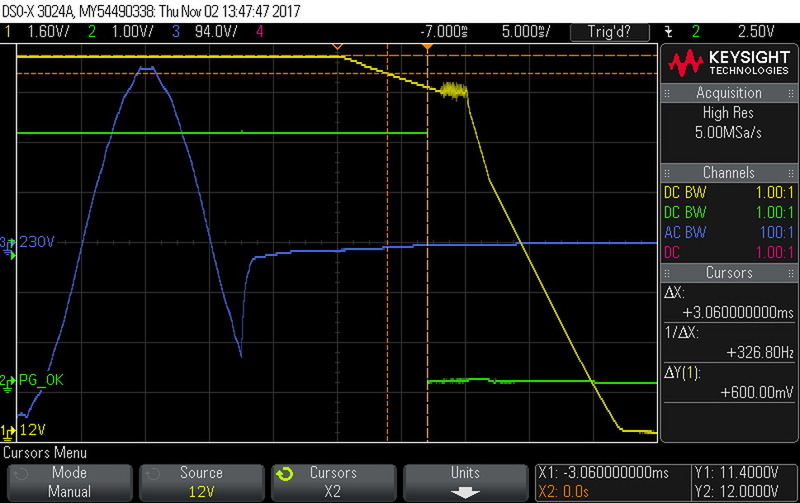 Only when we pushed the PSU beyond its limits did we see the +12V rail go south, and besides a huge voltage drop, it also failed to keep ripple in control. 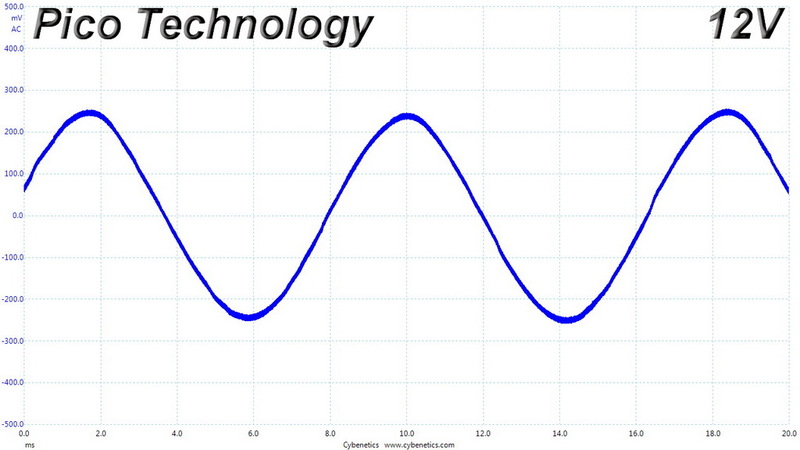 There is a peak at the higher frequencies, with only the average detector though exceeding the limit. 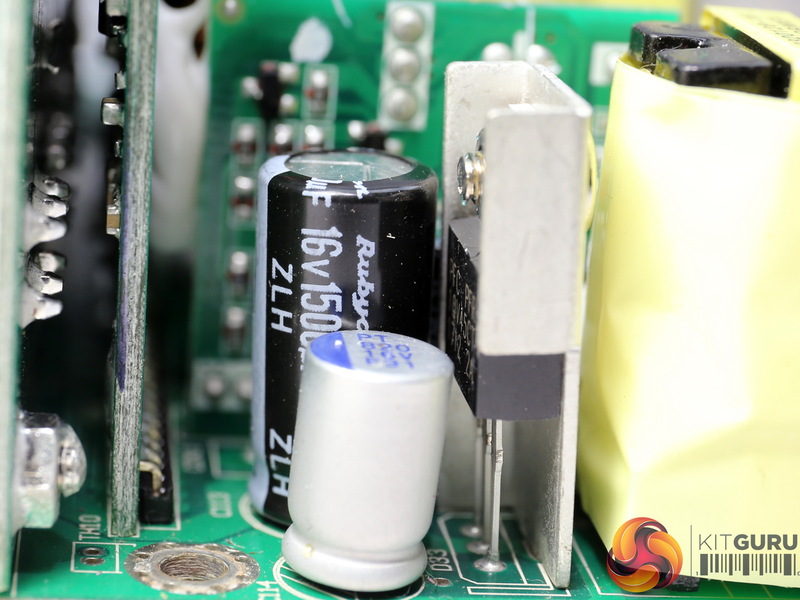 We usually measure EMI spurs at low frequencies, but in this unit it is the other way around. 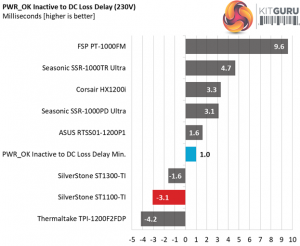 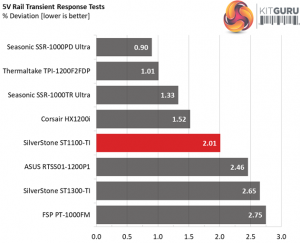 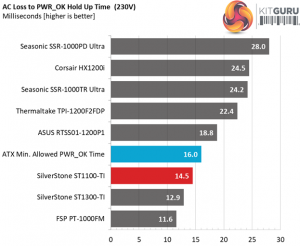 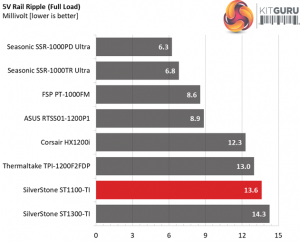 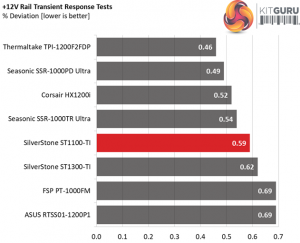 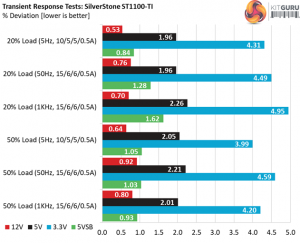 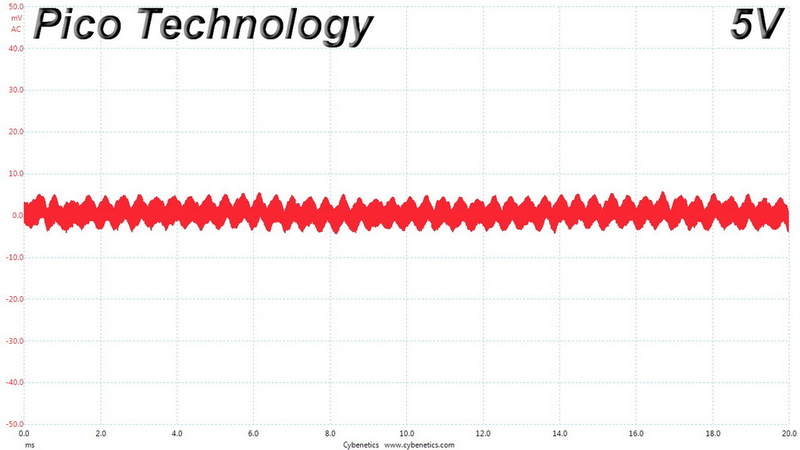 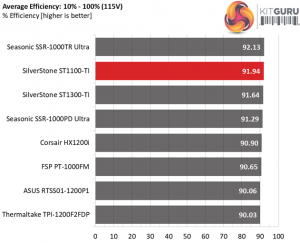 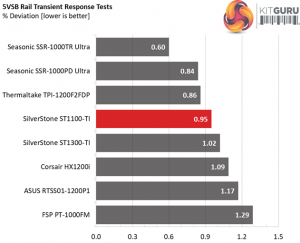 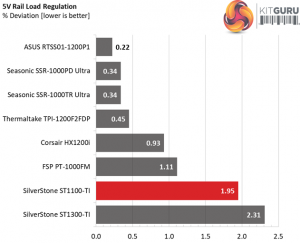 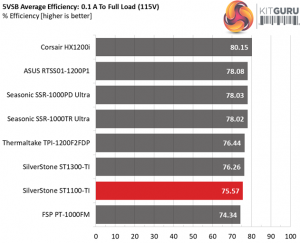 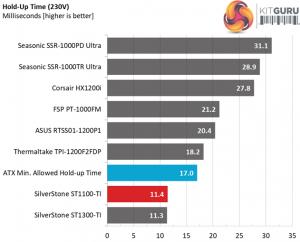 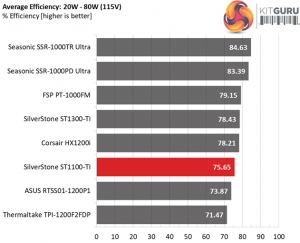 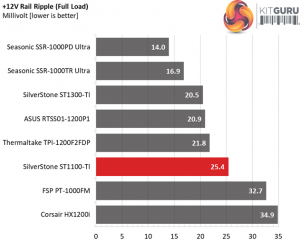 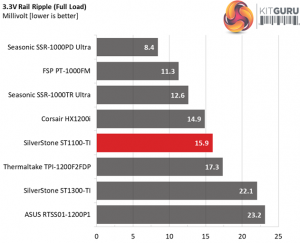 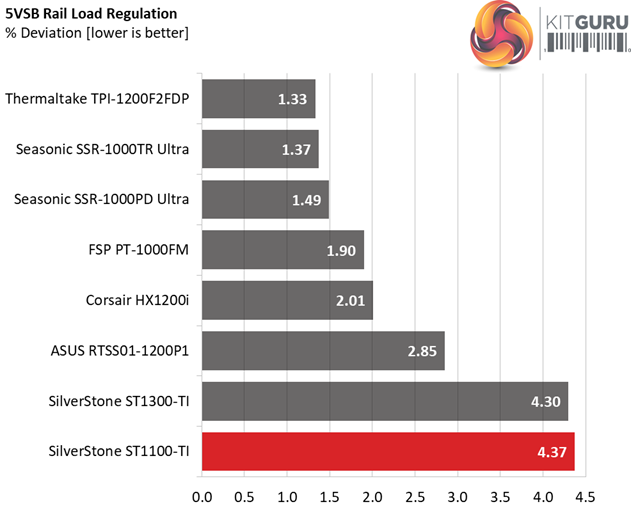 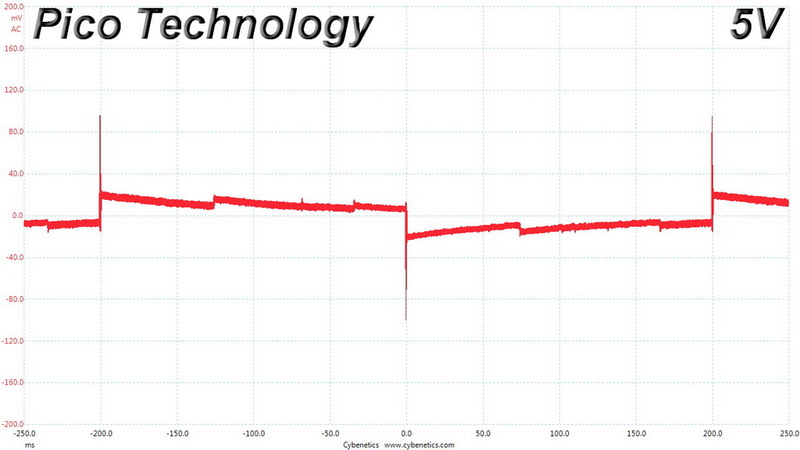 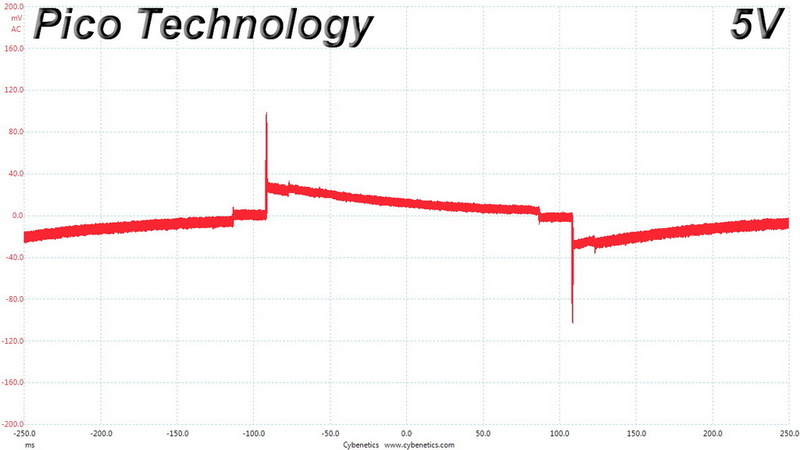 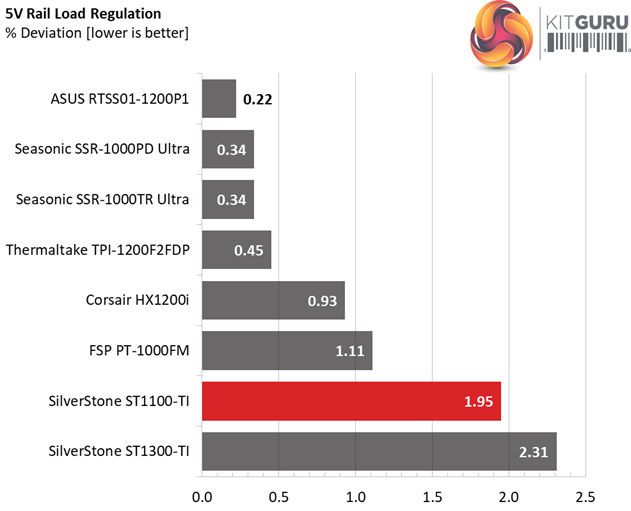 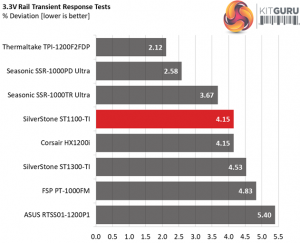 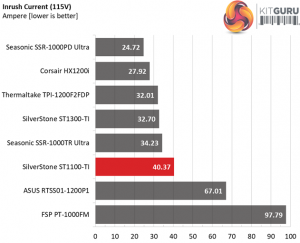 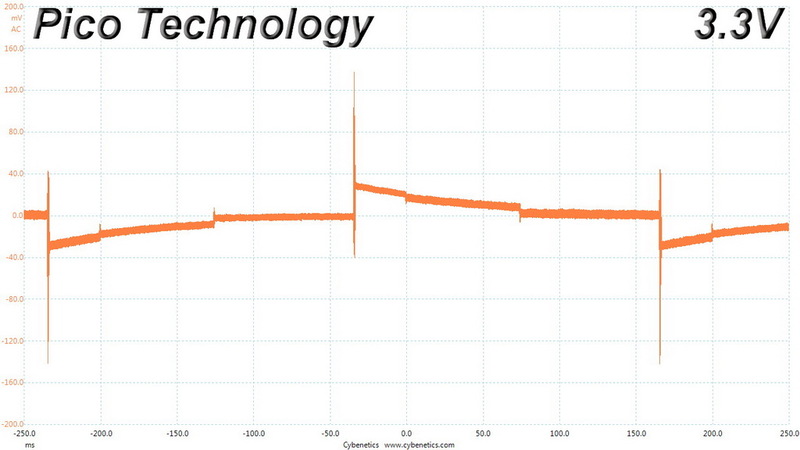 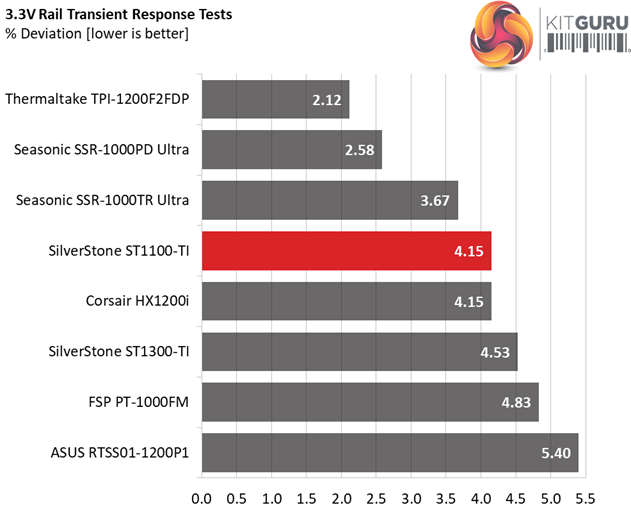 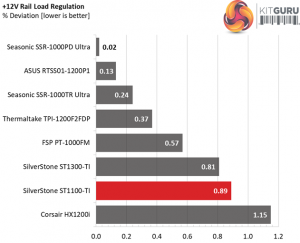 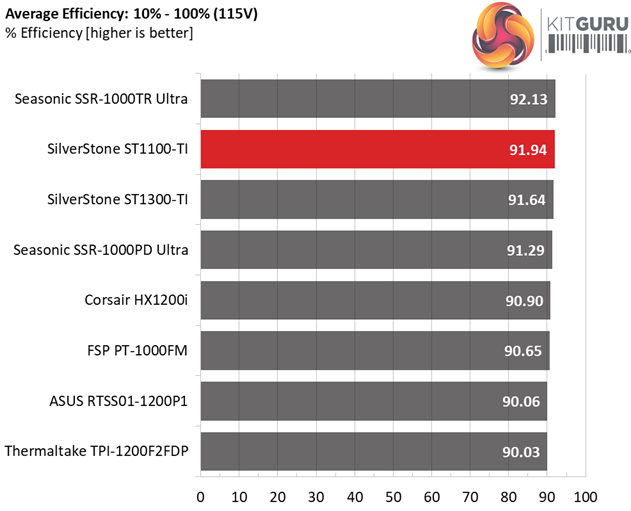 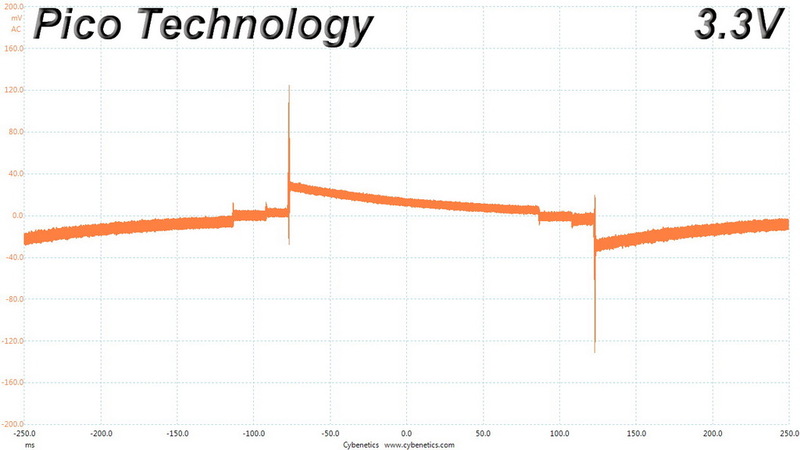 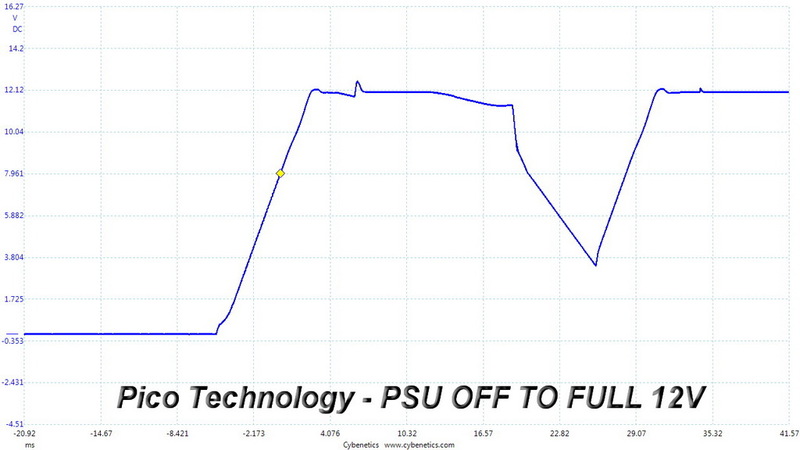 The following graph shows the ST1100-TI’s total performance rating, comparing it to other units we have tested. 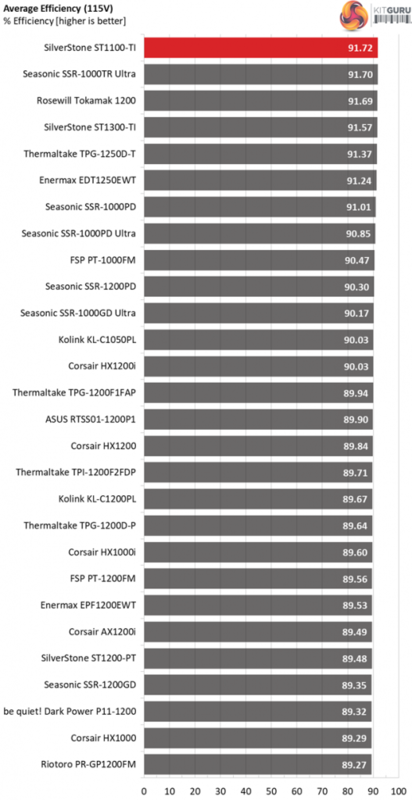 To be more specific, this tested unit is shown as 100 percent, and every other unit’s performance is shown relative to it. The overall performance is high enough, but we would like to see more from a Titanium and ETA-A+ certified unit. 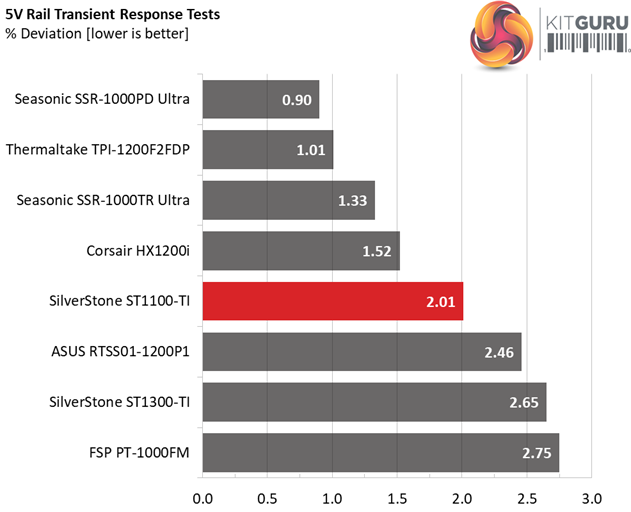 The following chart may be the most interesting to many of you because it depicts the product’s performance-per-dollar score. We look up the current price of each PSU on popular online shops and use those prices and all relative performance numbers to calculate the index. Note that all of the numbers in the following graphs are normalised by the rated power of each unit. The high price doesn’t help the performance per buck score. 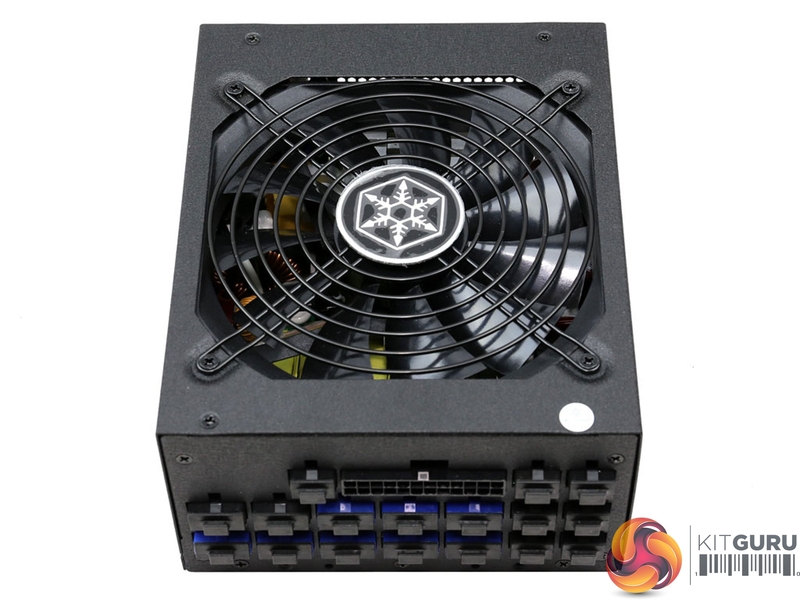 This is not the ideal power supply for users that need to build a silent gaming system. 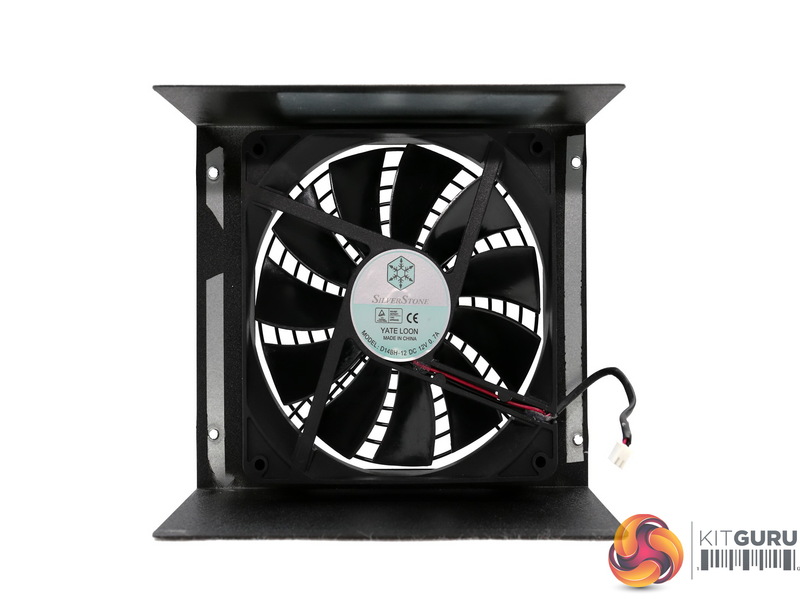 Under high loads the fan makes a significant amount of noise which won’t pass unnoticed by anyone, that’s for sure. 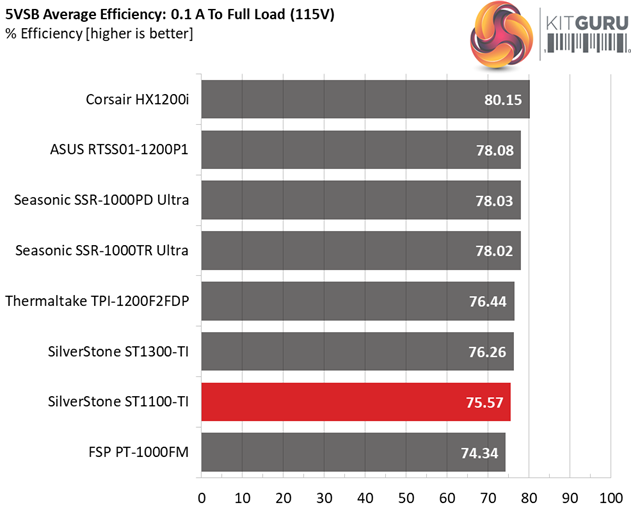 With several thousand different load combinations, the ST1100-TI manages to conquer our efficiency chart. This is a highly efficient platform, but it is safe to say Enhance had to make several major compromises in order to achieve this. 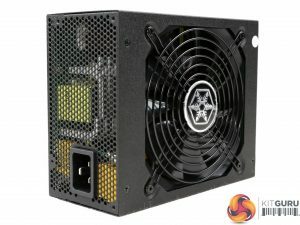 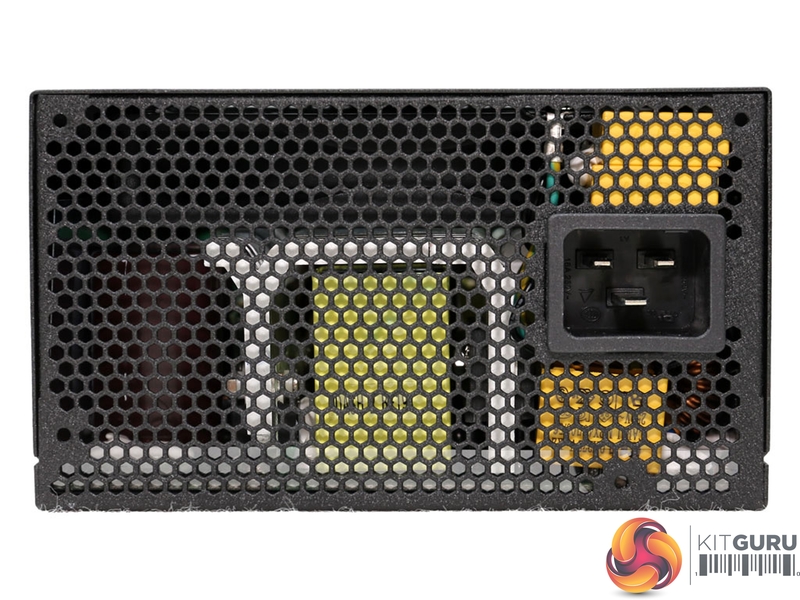 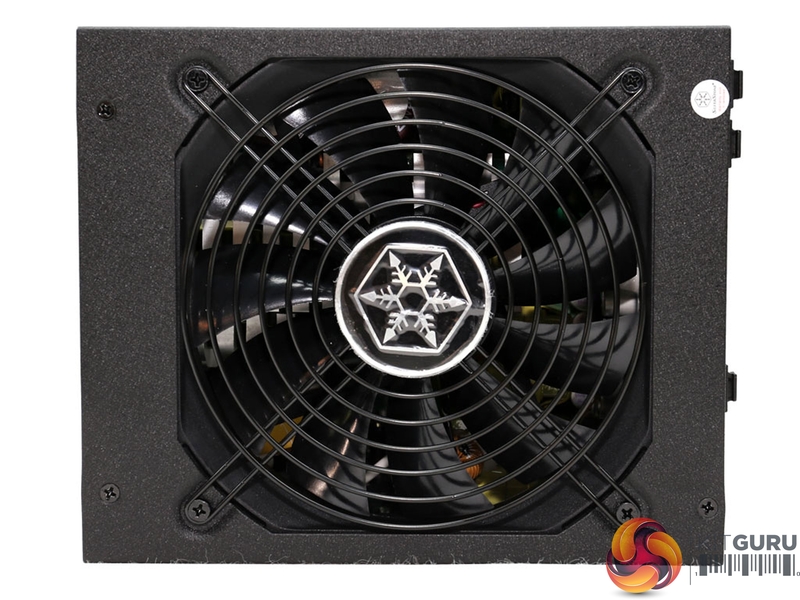 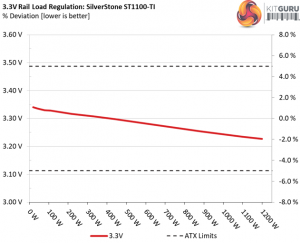 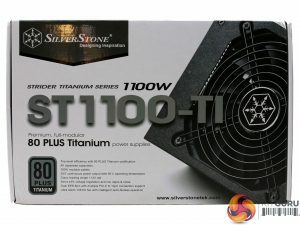 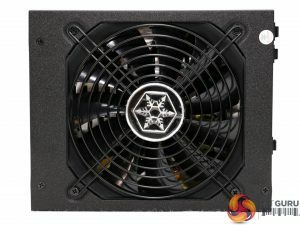 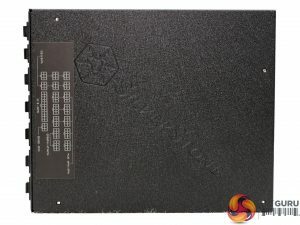 The SilverStone Strider Titanium 1100W retails for $299 in the US while in the UK market is sold for £269.99, and its headline feature is certainly the fact that it is one of very few power supplies able to meet the 80 PLUS Titanium and the Cybenetics ETA-A+ efficiency requirements. 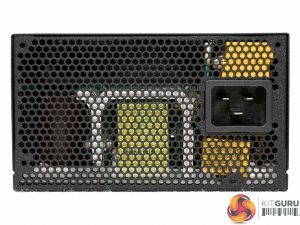 Its platform is among the most efficient that I have ever encountered but is this enough to justify its stiff price? 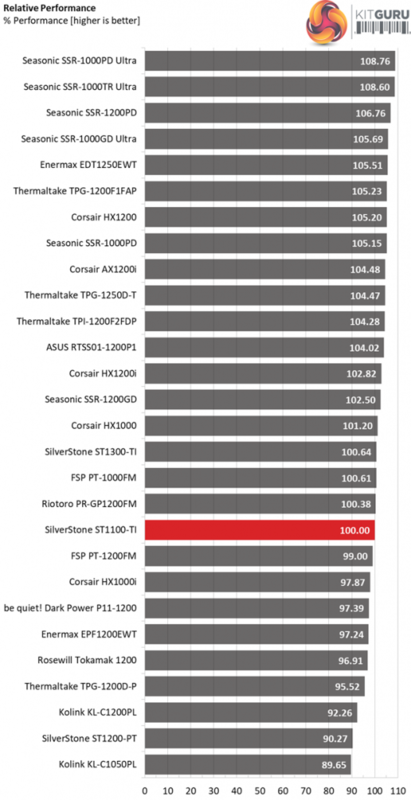 Unfortunately, for SilverStone, I don’t think so. 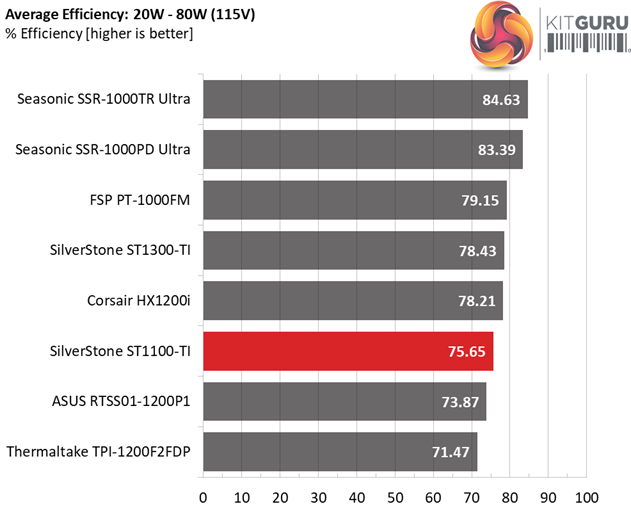 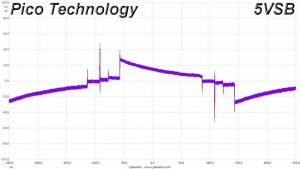 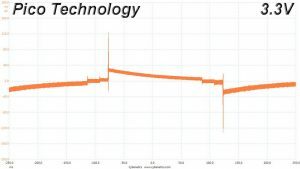 Enhance Electronics, the maker of this platform, apparently had to make several compromises in order to offer such high efficiency levels, and while in terms of efficiency it achieved its goal, the overall performance cannot quite match the other high-end offerings in this price range. 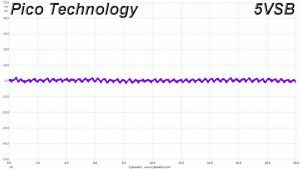 The ripple suppression is great, though, and the load regulation at +12V is tight enough, however the rest of the rails do not have as tight voltage deviations. 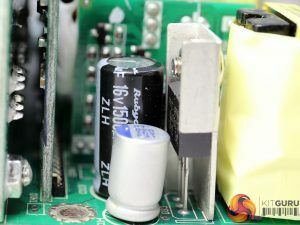 In my opinion, though, the biggest problems with this unit are the low hold-up time and the inaccurate power ok signal. 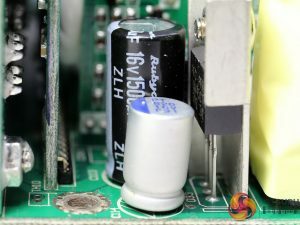 The APFC converter’s bulk caps, aside from being expensive, can greatly affect the overall efficiency, so Enhance chose to use caps with lower than optimal capacity here and this leads to a very low hold-up time. This is not acceptable of course for any power supply that claims to meet the ATX spec’s standards. 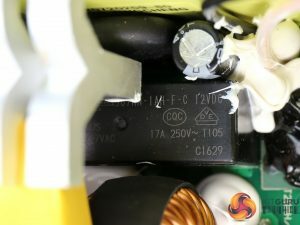 Another thing that bothered me was the very small headroom on the +12V rail. 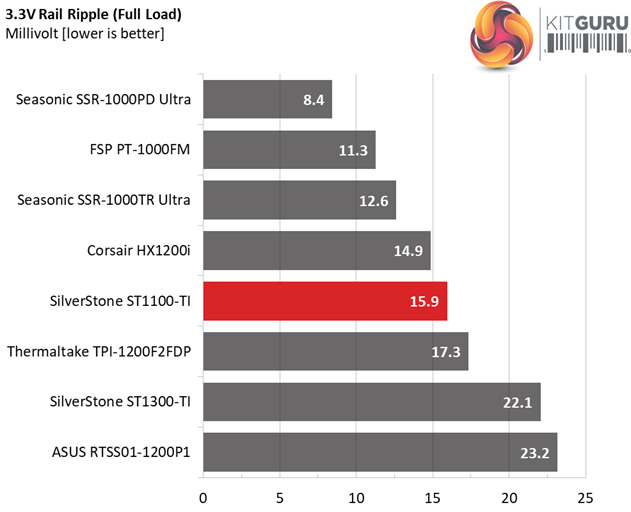 Once I loaded it a little beyond the official specs, its load regulation and ripple suppression went completely out of control. I did stress it at a very high ambient temperature and most likely this played an important role here, however this is still one of the few Enhance platforms that can deliver full load continuously at 50°C, so I wanted to test its limits. 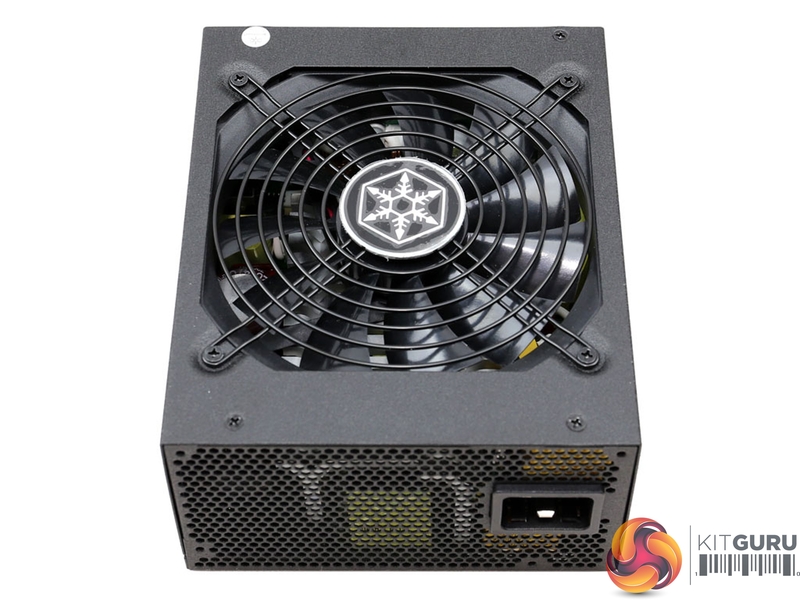 I have seen some great and innovative designs from Enhance, for example the passively cooled Nightjar NJ450-SXL which proved very impressive, however I cannot say the same for today’s review sample. Although it is very efficient, its fan profile is poorly tuned so the overall noise exceeds 40 dB(A). 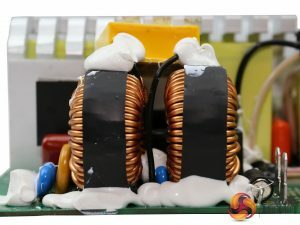 Moreover, it lacks a power switch which is still essential for any power supply, while it should also provide a way to turn off the semi-passive operation. 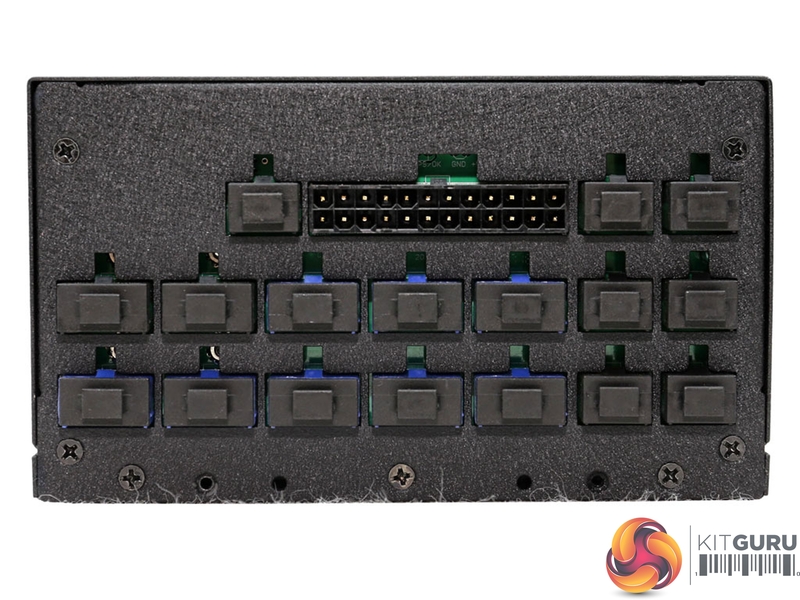 On the positive side, this unit has eight PCIe connectors, hosted on dedicated cables, and there are more plenty of peripheral connectors. The dimensions are small enough, but not that impressive when we take into account the fact that the 1500W model shares the same exactly chassis as this unit. 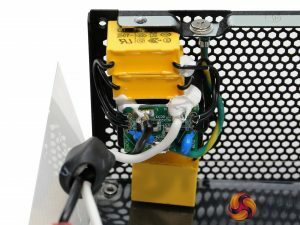 Finally, the use of a double ball bearing fan means that – besides high noise – this PSU won’t have a problem with high ambient temperatures, as long as you don’t exceed its nominal capacity. 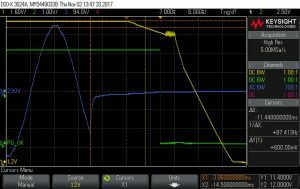 Find the issue that causes so much trouble at +12V with a little higher than the nominal load, even with a steady voltage input. 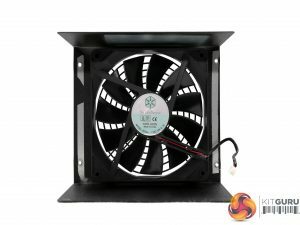 Better fan profile for quieter operation. 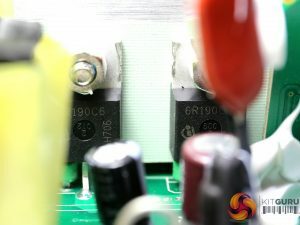 A way to deselect the semi-passive operation. 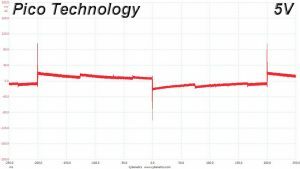 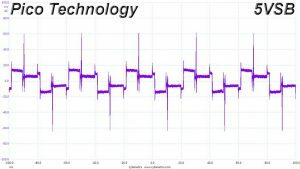 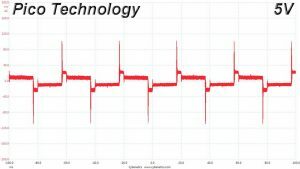 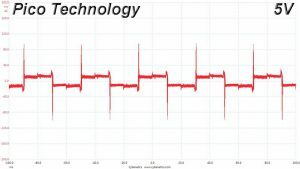 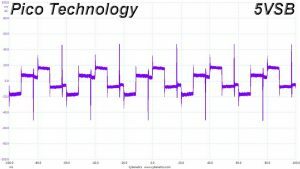 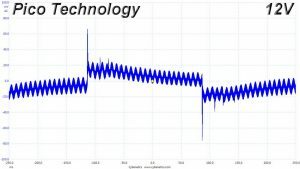 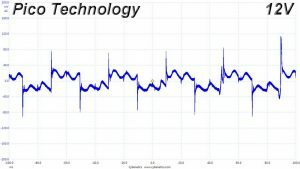 Better transient response at 3.3V. 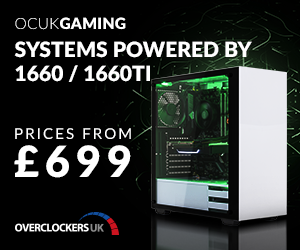 You can get the SilverStone Strider Titanium 1100W from Overclockers UK for £269.99 inc VAT HERE. 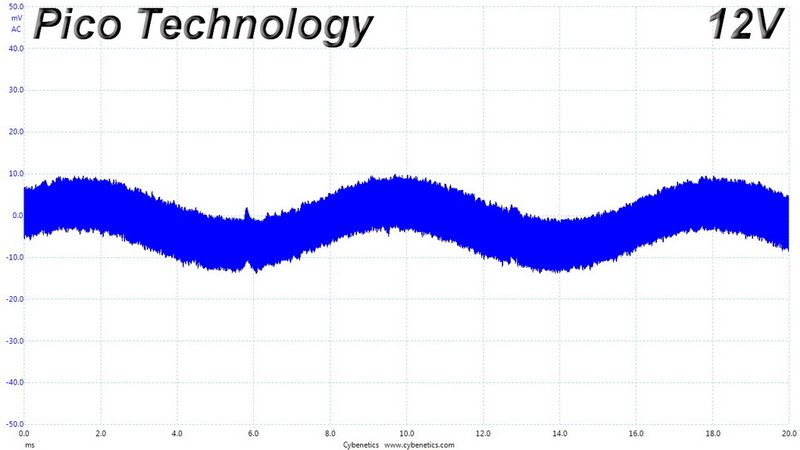 Tight enough load regulation at +12V and good transient response on the same rail. 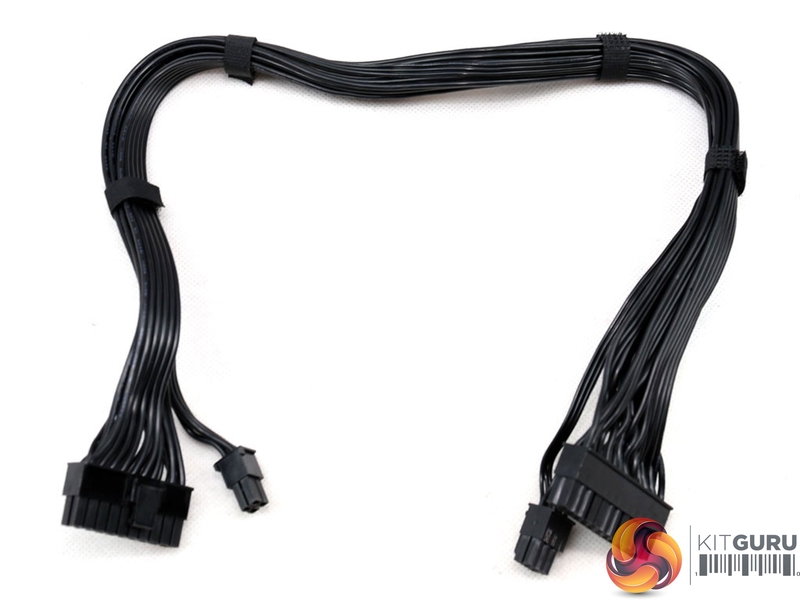 Dedicated cables for the PCIe connectors. 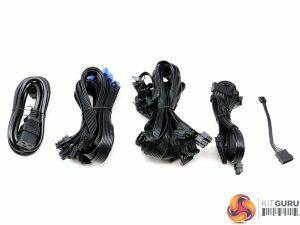 Loads of cables and connectors including 8x PCIe and 2x EPS. Semi-passive operation (which cannot be deactivated though). 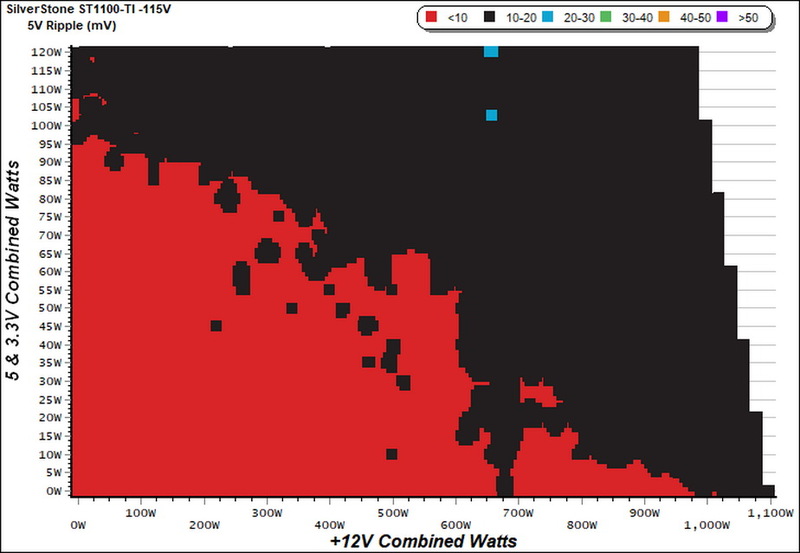 The +12V rail’s performance deteriorates with >95A load. 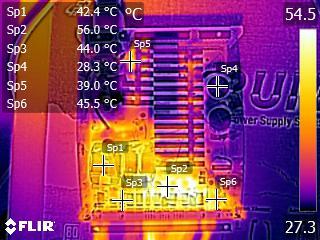 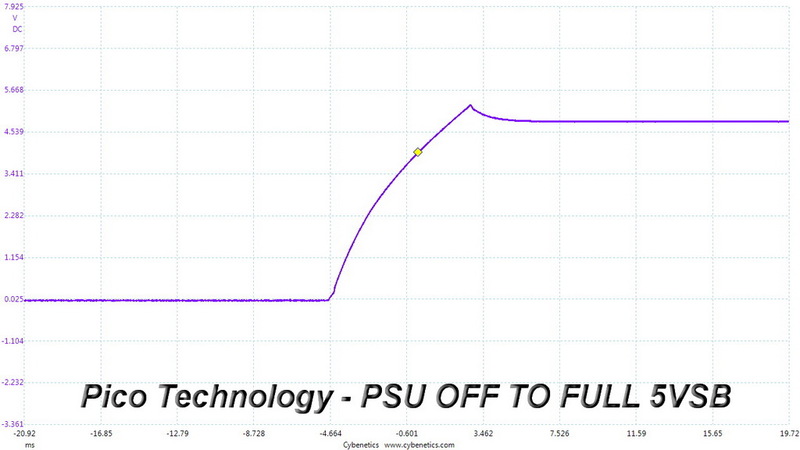 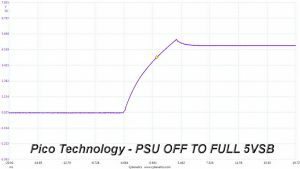 Noticed a glitch in the transient response tests in the “PSU Off to Full +12V” scenario. 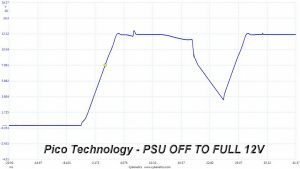 Very high OCP at 3.3V. The competition provides longer warranty periods (though five years is perfectly fine with us). 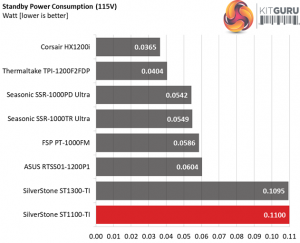 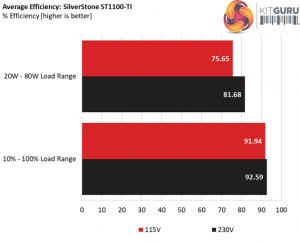 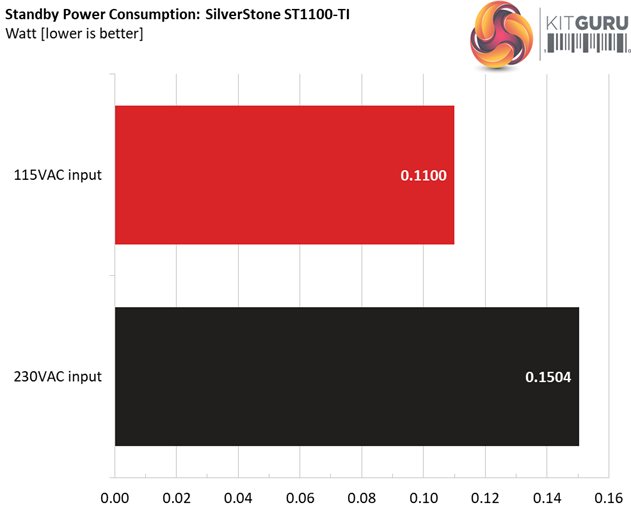 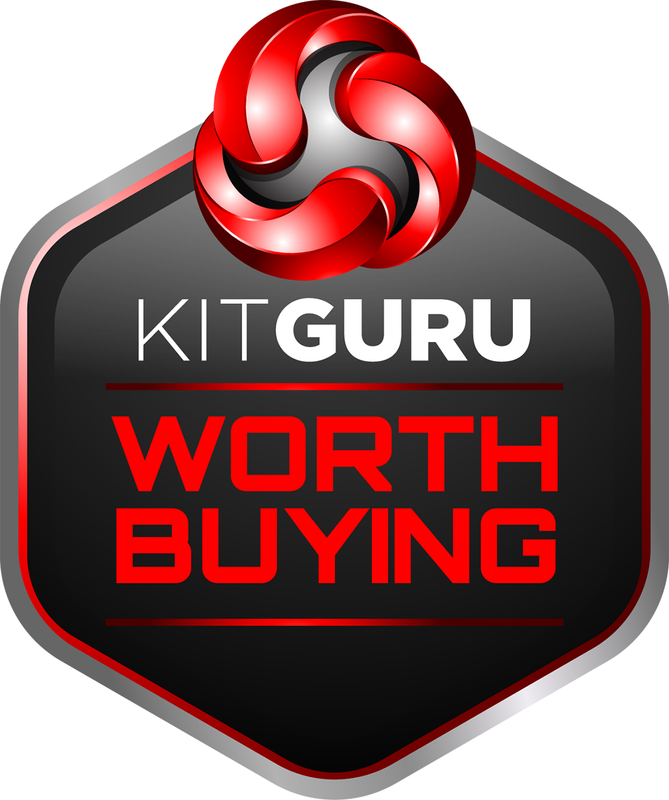 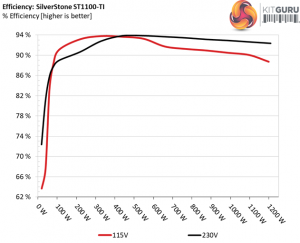 KitGuru says: The SilverStone ST1100-TI is among the most efficient power supplies that we have ever tested, however it needs some improvements to truly rival the best options in this price range. 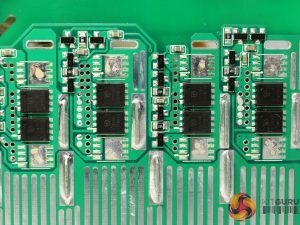 The most significant issues that we spotted testing this product are the loose load regulation and the ripple problem at +12V.